Billed as the ultimate city scooter, the Taiwanese manufacturers latest offering brings inner-city dwellers a practical layout and confidence inspiring ride. 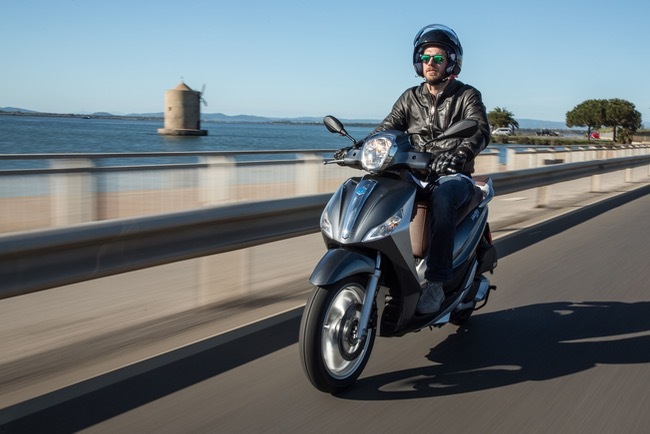 KYMCO’s new-model onslaught rolled on this week with the arrival of the new Agility 16+ 200i city scooter at dealerships across the country. 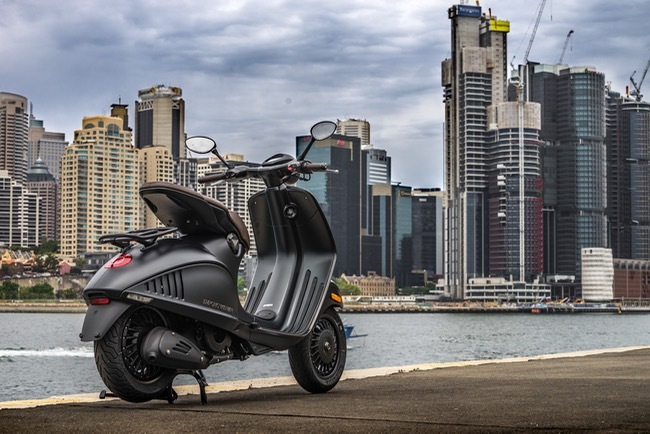 “The effort around Agility 16+ 200i has been laser-focused on delivering practical features that make great sense in the city environment,” explained KYMCO Australia’s Michael Poynton. The fuss-free features include expansive lockable storage courtesy of the included top case, under seat area and front glove box compartment. 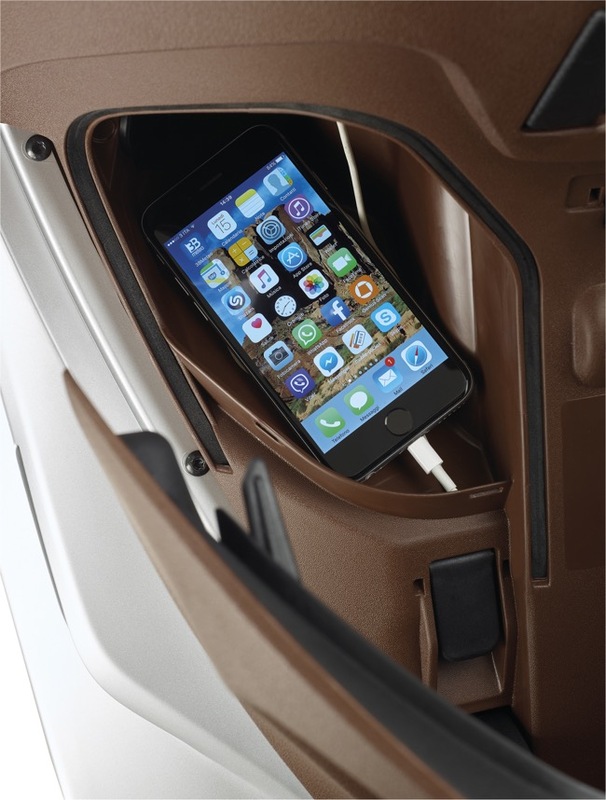 That same glove box compartment conceals a 12V DC outlet capable of recharging electronic devices on the go. Additional city focused features include an effortless centre stand to make parking simple, a steering lock to deter theft and room to carry a pillion passenger. The attention to inner-city requirements doesn’t end with the practical layout. “We wanted Agility 16+ 200i to be stable and confident in its handling but agile enough to easily out manoeuvre the obstacles of day-to-day life in city,” said Poynton. 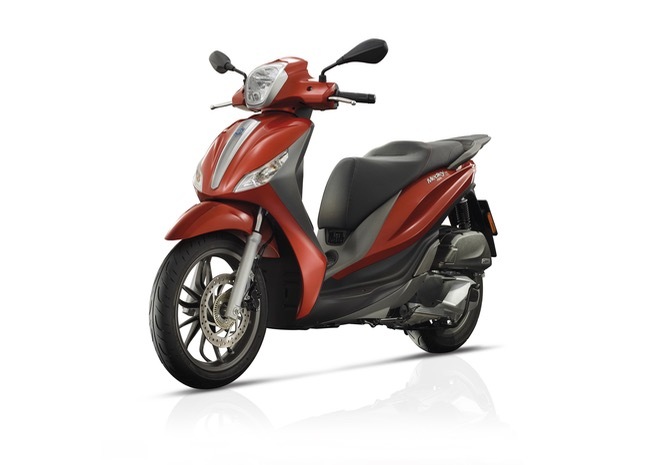 The new model gets the same proven four-stroke, fuel-injected 163cc engine as its retro styled cousin, the Like 200i. The engine is coupled to a simple twist and go transmission and its fuel injection has been carefully mapped to maintain consistent economy yet still spring to life when escaping traffic. Agility 16+ 200i delivers standout styling with a sharp, clean urban design that features an integrated lighting layout, cut-off front screen and ten-spoke wheels. The design is available in a choice of three colours and also accommodates a flat floorboard and wide front fairing to provide riders protection against any weather. 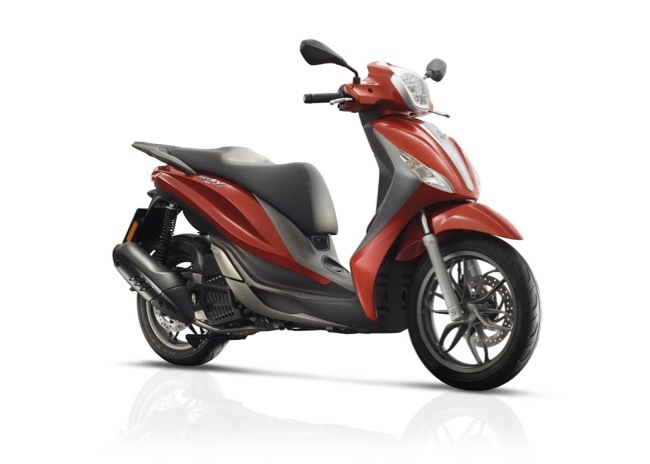 The new Agility 16+ 200i city scooter is supported by a three-year warranty program and is available in dealers today. Customers have turned to KYMCO for unmatched quality, unsurpassed capability and unequalled value for more than 50 years. With 2015 sales and revenues of more than $1.34 billion, KYMCO is a recognised global leader in the manufacture of scooters, all-terrain and utility side-by-side vehicles. A group of Taiwanese businessmen partnered Japan’s Honda Corporation to found KYMCO in 1963. The Japanese influence introduced an unrelenting focus on constant improvement and quality. In 2016, KYMCO will produce more than 1.2 million vehicles for export to 100 countries. 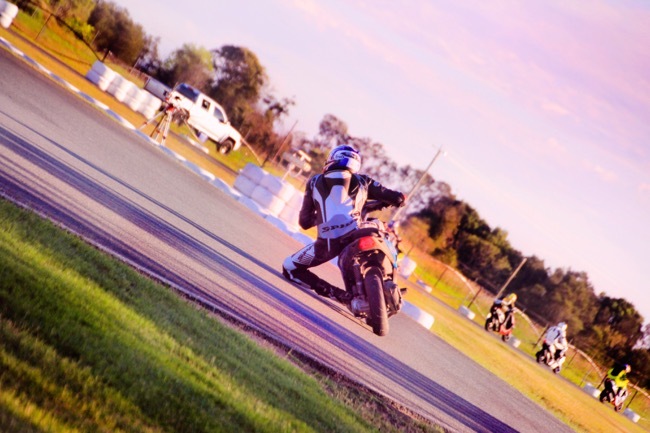 After just 12 years, Mojo Motorcycles has established itself as Australia’s most exciting and fastest growing motorcycle company. 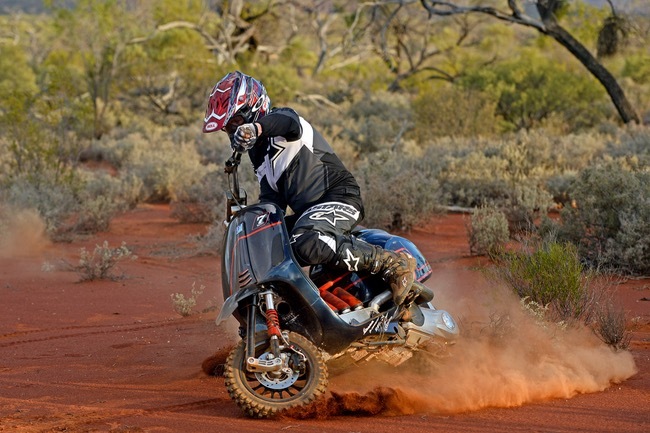 The Melbourne-based company imports and distributes globally recognised brands including CFMoto and Sherco. The company supports a retail network of almost 90 dealers which continues to grow. Mojo Motorcycles has built its base on offering customers quality motorcycles, scooters and ATV’s. Peter Stevens Adelaide Scooter Ride Event! Sydney has had their ride, now it's time for Adelaide's turn! Join us for the Adelaide Scooter Ride Event on Saturday 4th June! 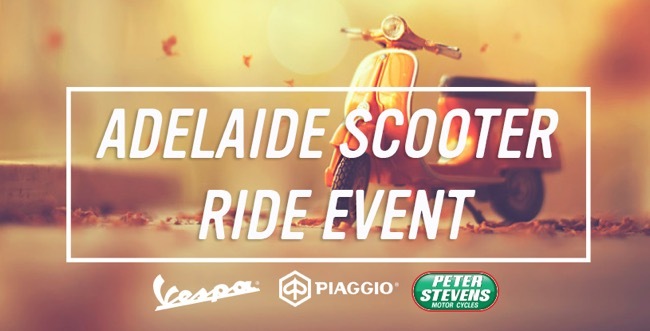 Join us for the Peter Stevens Adelaide Scooter Ride Event! Meet on Saturday 4th June, 2016 at 12:30pm for a 1pm departure. Meet at Peter Stevens Adelaide, 221 Franklin Street, Adelaide SA, 5000. We will begin from Peter Stevens Adelaide and will finish at Cibo Espresso Torrensville. In case of wet weather please contact Peter Stevens Adelaide for updates. Scooter Central, Vespa Australia and Sydney put on a perfect combination of weather, hospitality and good times for todays Sydney Scooter Ride. Scootersales.com.au were very happy to be invited and attend todays Sydney Scooter Ride hosted by one of Sydney’s leading Vespa/Piaggio dealerships, Scooter Central. In true Scooter Central style all riders were made to feel welcome at Scooter Central in Brookvale on Sydney’s Northern Beaches with a smile and a coffee, what better way is there to start a Sunday morning? 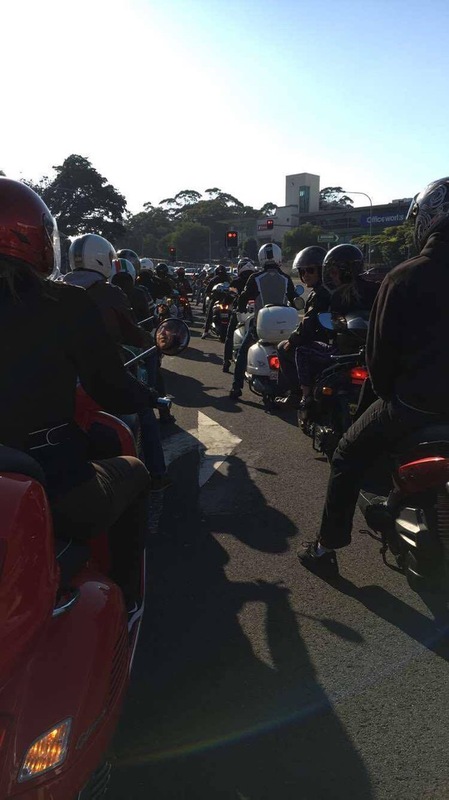 Sydney didn’t disappoint with the weather either with temperatures in the mid twenties and glorious sunshine, the perfect combination for a ride with a great bunch of fellow scooter riders. After a good chin wag at the shop, mainly about each others rides (from the classic Vespa PX’s to the modern Piaggio BV 350ie and three wheelers) the thirty plus riders took to their respective scooters and then to the streets. 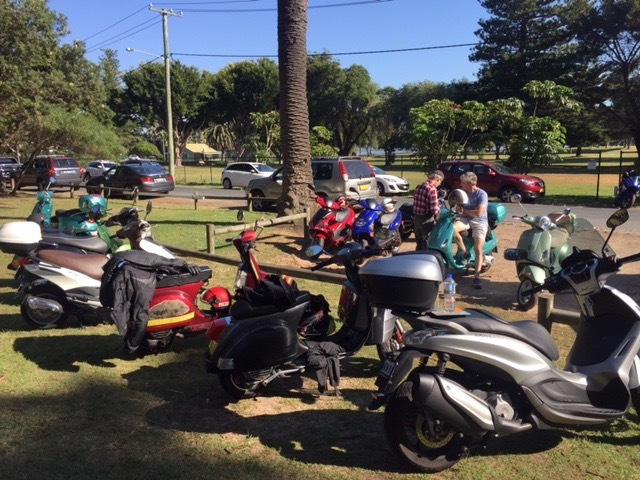 Scooter Central led the pack of riders along Sydney’s iconic Northern Beaches passing Dee Why, Narrabeen, Mona Vale and heading all the way north, even winding around Whale Beach Road to take in more coastal views and eventually stopping at Governor Phillip Park at Palm Beach for well earned cakes and refreshments. 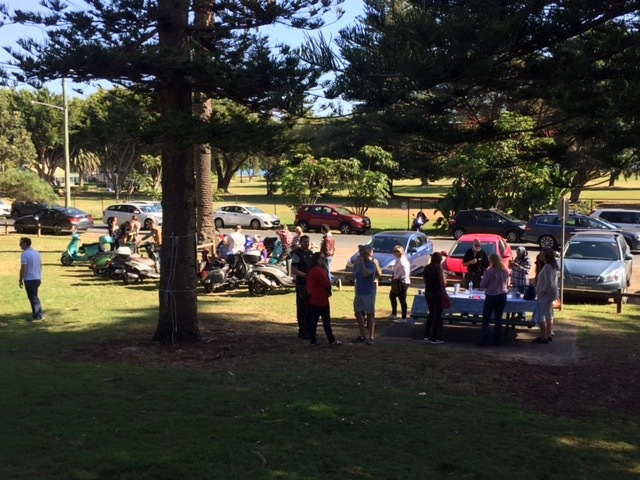 Riders were then able to relax in the park, talk about the ride, their scooters and checked out the Palm Beach Markets. All-in-all an enjoyable morning was had by all. 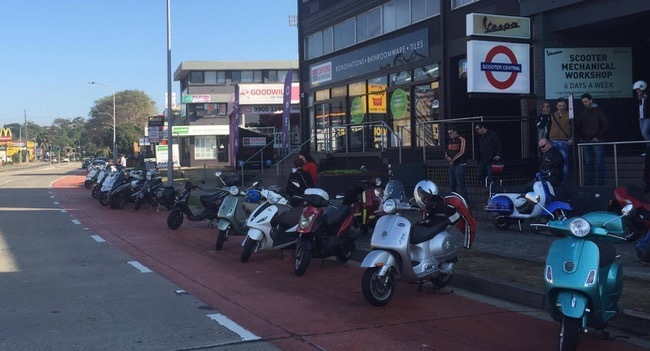 A big thank you goes out to Scooter Central, Brookvale and Vespa Australia for supporting such an event. This is what the scootering lifestyle is all about! 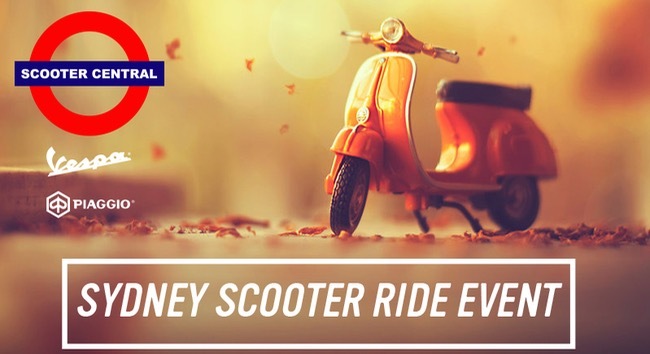 Stay up to date with the latest events by liking Scootersales on Facebook. 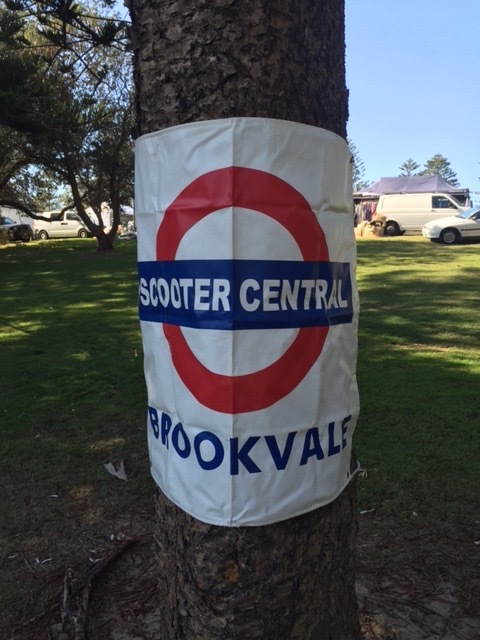 On Sunday 22nd May 2016 Scooter Central, Brookvale will be hosting an enjoyable group ride on Sydney's beautiful Northern Beaches. 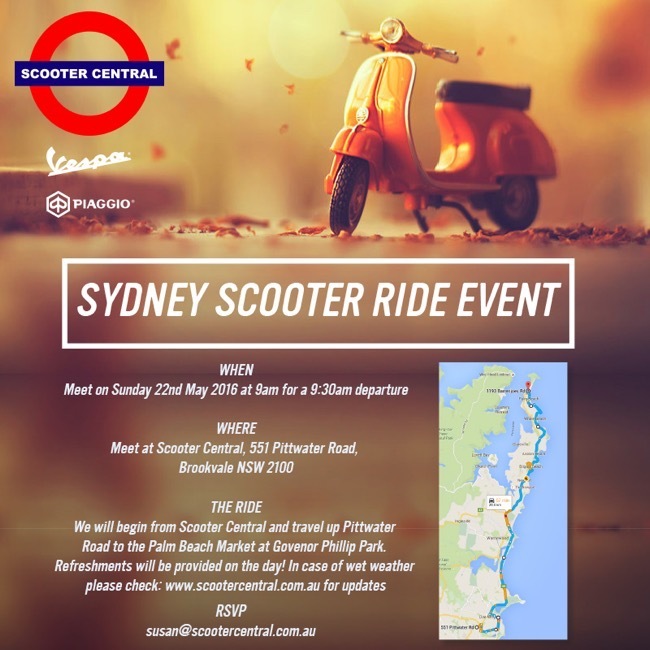 Join us for the Sydney Scooter Ride Event! 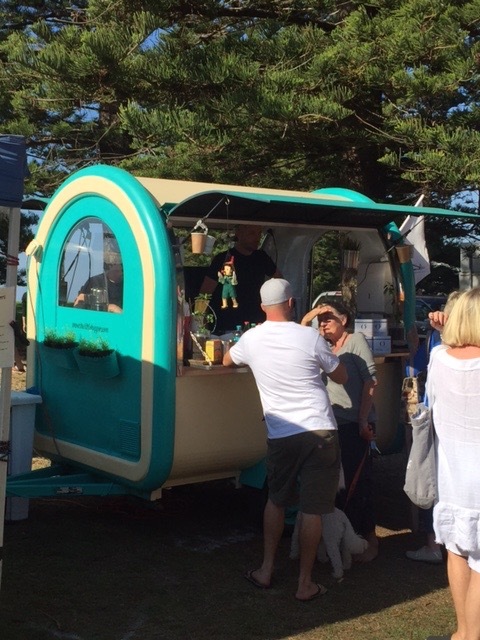 We will begin from Scooter Central and travel up Pittwater Road to the Palm Beach Market at Governor Phillip Park. Refreshments will be provided on the day! In case of wet weather, please check: www.scootersales.com.aufor updates. What do you do when you’ve got almost 16kms to cover between the starting line and the campsite when you’re on the salts flats? 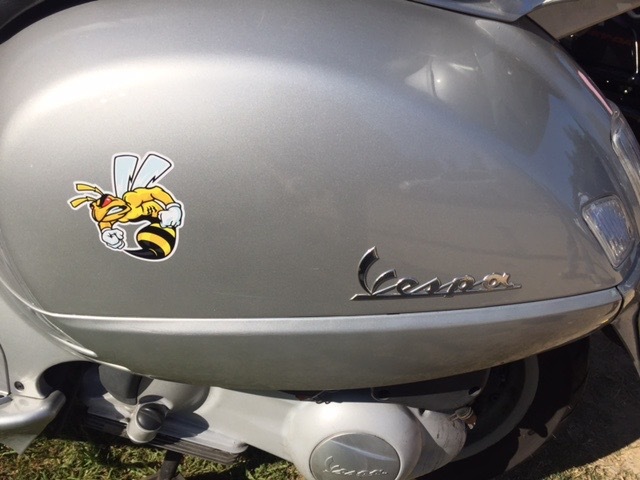 You make the meanest Vespa around, that’s what. 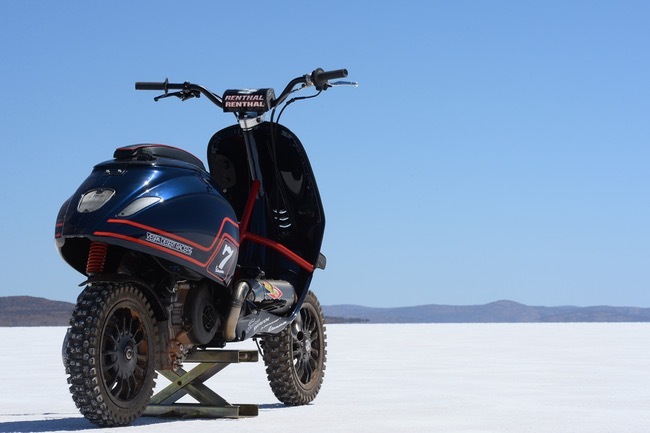 While out on Lake Gairdner in South Australia for a week of land speed racing on the salt flats, a workhorse was needed for PS Imports Director Paul Chiodo for traversing the deep desert sand and rocky terrain between homebase and the starting line for the Triumph Salt Racer. While the Piaggio Typhoon 125 that was in use was fine for the lake, it battled against the harsher Australian landscape. 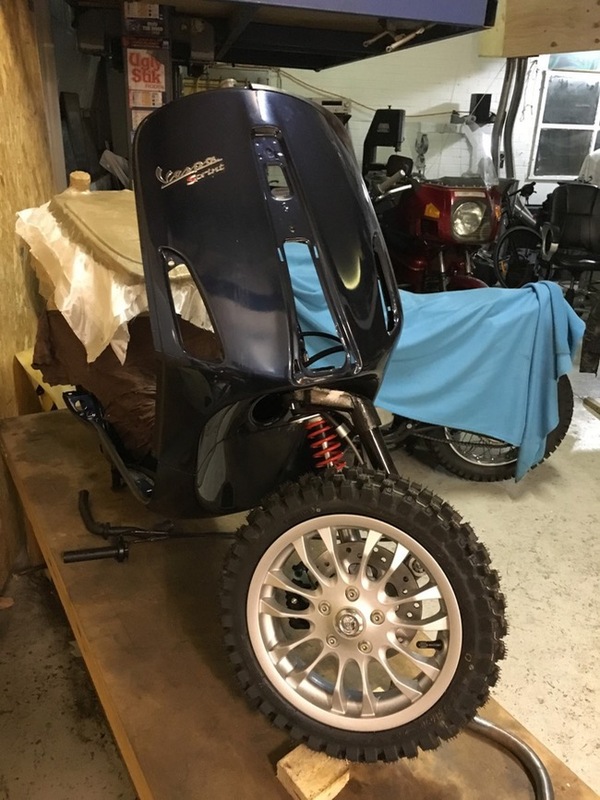 An idea had now sparked, and a collaboration was created between Melbourne based Supacustom and Vespa Australia to create a machine that could tackle the tough terrain for those all-important beer runs (and other jobs, we’re sure). 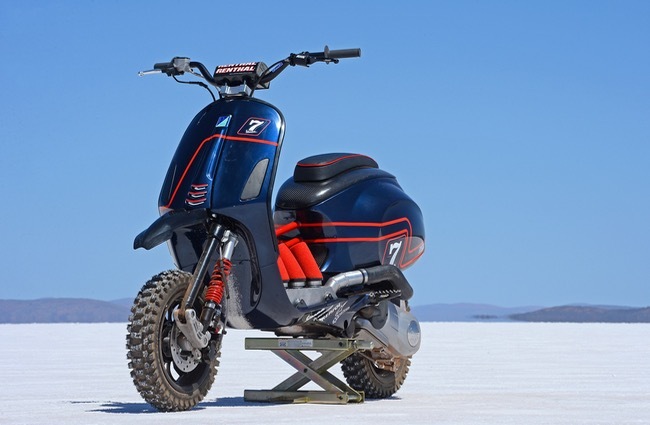 The basis for this zippy desert racer would be a 2015 Vespa Sprint 150 I.E 3 valve, chosen for its classic look, clean lines and new 3 valve motor. 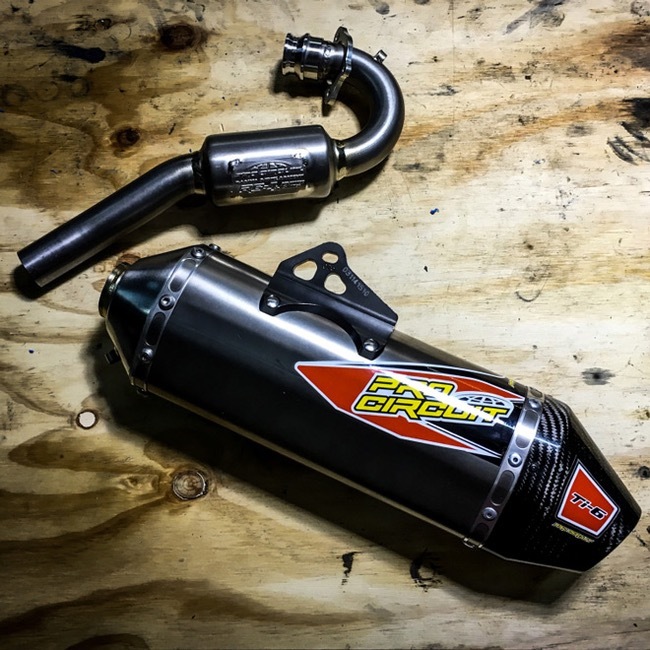 “One of the challenges of this project is finding, adapting and fitting parts that will take the VDR to Desert racing stardom. 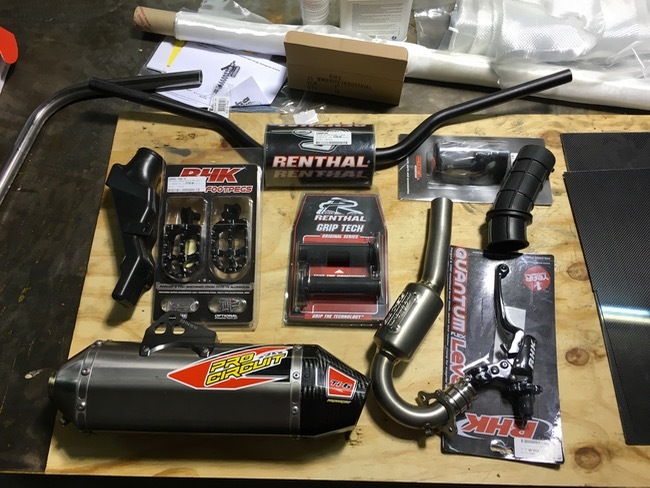 As far as aftermarket scooter parts go; desert racing / off road components are not high on manufacturer’s priorities. For this reason, we have had to improvise and pick the best option that will work – often with heavy modification. As our parts started to arrive the anticipation started to build, and we soon found that each part created its own series of problems.” This would be no simple stripping of parts and bolting on of new ones as the project began to grow, and by Paul Chiodo’s own admission the build started to get “out of hand”, not that that’s a bad thing. The crew got to work stripping the body back to a bare shell, with any and all redundant parts being cut from the body. To make sure this Vespa was good and sturdy for it’s forthcoming life of desert abuse its body was reinforced in the forward and aft, and side-to-side. 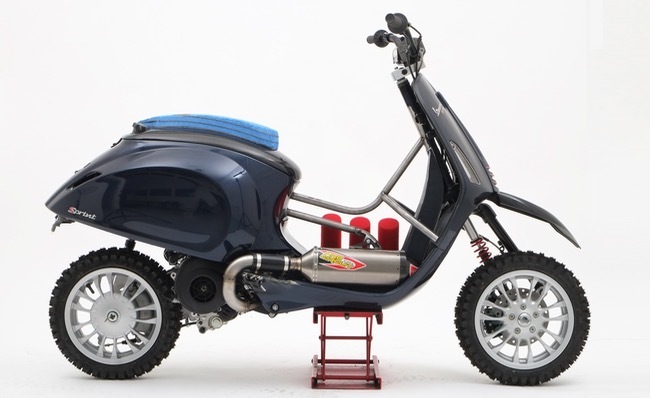 The end product would be a super aggressive, nimble Vespa the likes none have ever seen. A beauty to look at – but a mean ***. Just like the Australian bush it was built for. Credits go to awesome custom bike blog Throttleroll.com for the article, photos from a man who can capture the best adventure sports moments Jeff Crow jeffcrowphoto.com and last but not least the genius build from Supacustom in Melbourne along with Vespa Australia. 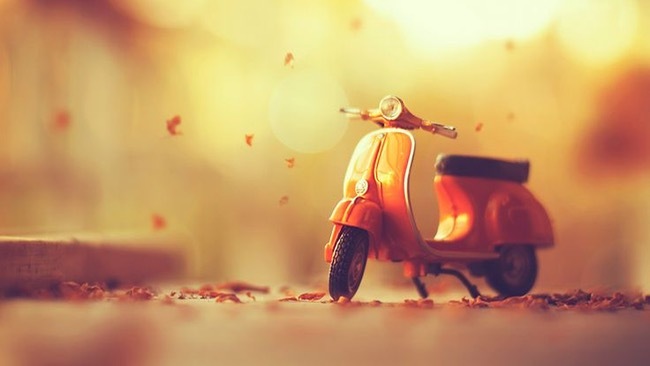 Thanks to all for bringing this special take on the classic Vespa. The Ute Scoot has landed in Australia. One of the most cost efficient and practical ways to deliver anything, anywhere, anytime. SYM's New Ute Scoot Is Here! The Ute Scoot has proven itself in the European market and is backed in Australia by Select Scootas who have been distributing and backing their scootas since 1999. Select Scoota's company philosophy is to deliver a quality product, at a competitive price with exceptional service. So here's a delivery scooter the really delivers! 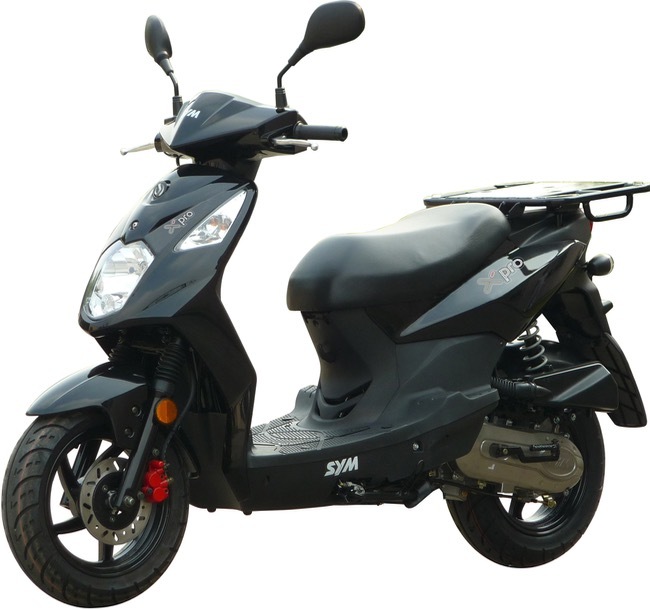 The Ute Scoot is based off the tried and true SYM Orbit model with it's reliable and punchy 125cc motor to get you around town. This new model has been purpose build to be the new delivery alternative for the Australian market. The 125cc motor is suited to city and suburban streets (not one for the freeways as I'm sure you may be tempted to load it up with your camping gear and ride off into the sunset when you see the size of the storage box) but is surprising zippy and capable of getting up to 70-80km quickly without any trouble and can be pushed over the 90km/h. The Ute Scoot main feature is that it boasts a huge 139 litre carrying capacity with its custom build reinforced fibreglass box and it's steel base bracket double shocks allow for a 45kg load. The first application that comes to mind is when looking at the large insulated box is home delivery's but there are many other uses for this scooter such as mobile hairdressing, emergency call outs, mobile gym/outdoor fitness instructors, small delivery and courier applications, call out trades people, the list is as large as your imagination. If you need something moved and want the convenience, ease of parking and general efficiency to move on a scooter the Ute Scoot could be the transport means you are looking for. The large clean white box is also a great place to market your business by branding it with your company details and use it as a mobile billboard. 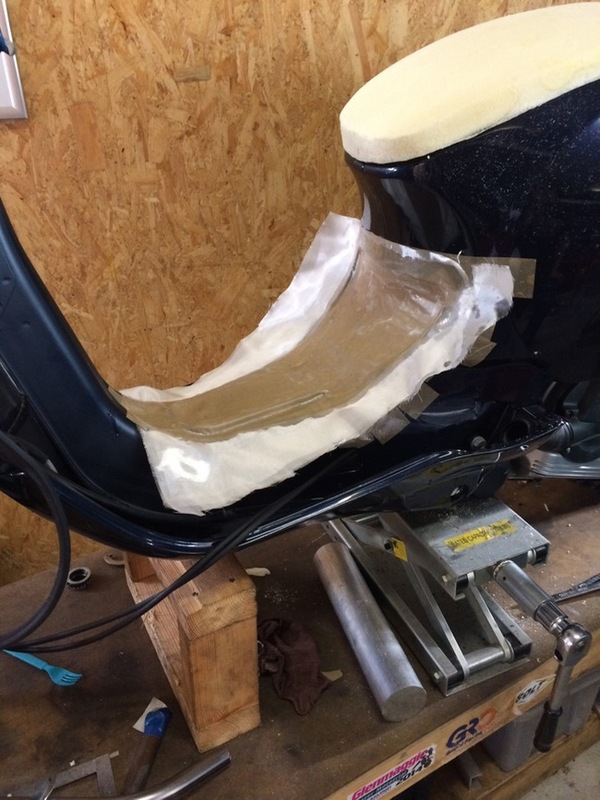 SYM really have thought things through by adding a large 9 Litre fuel tank (similar size 125cc scooters tend to have a 5-6 litre capacity), less stops mean greater efficiency and in the delivery game time can often mean money so this will alleviate frequently making pesky fuel stops. Other nice features are the 12 inch wheels and front disc brakes for added safety. Next time you order home delivery and here the doorbell ring, make sure you look outside, there is a good chance it is going to be delivered on a SYM Ute Scoot. 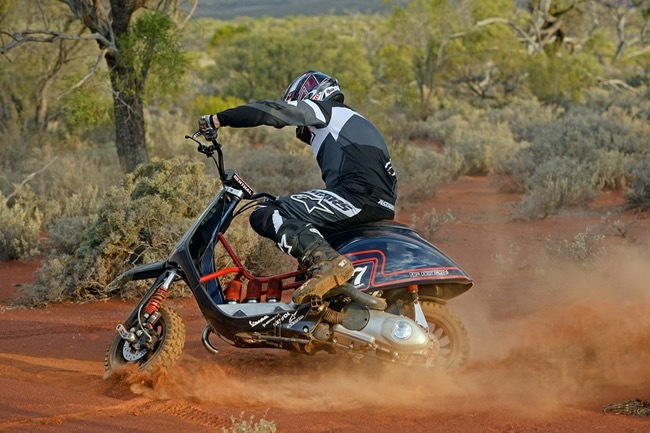 For more information on this model visit utescoot.com.au or to locate your closest dealer visit Scoota.com.au. We look forward to seeing how this scooter gets adopted into the Australian market. 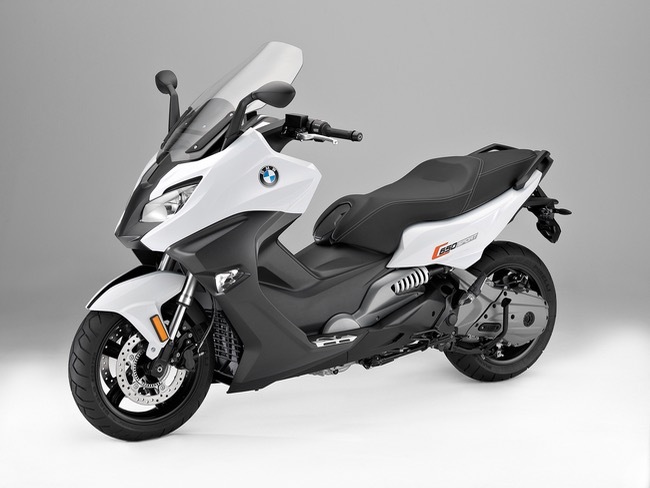 BMW has launched its new C 650 Sport and C 650 GT maxi scooters with an extensively modified drivetrain, retuned suspension and increased standard features ensuring they continue to deliver both practical and efficient urban commuting. 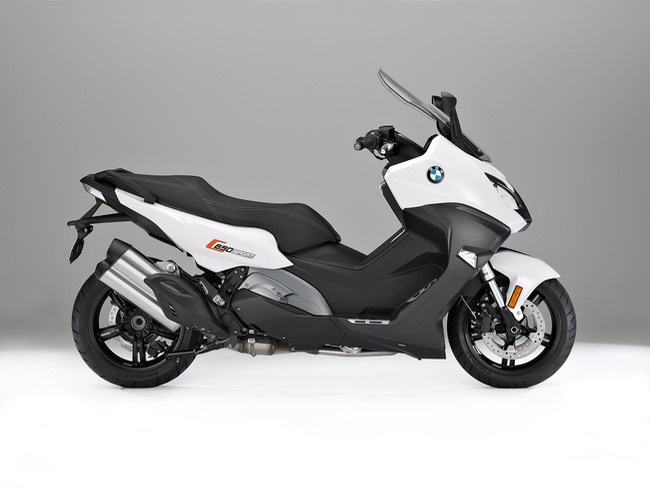 BMW has launched its new C 650 Sport and C 650 GT maxi scooters with an extensively modified drivetrain, retuned suspension and increased standard features ensuring they continue to deliver both practical and efficient urban commuting along with trademark BMW sports performance and grand tour cruising. 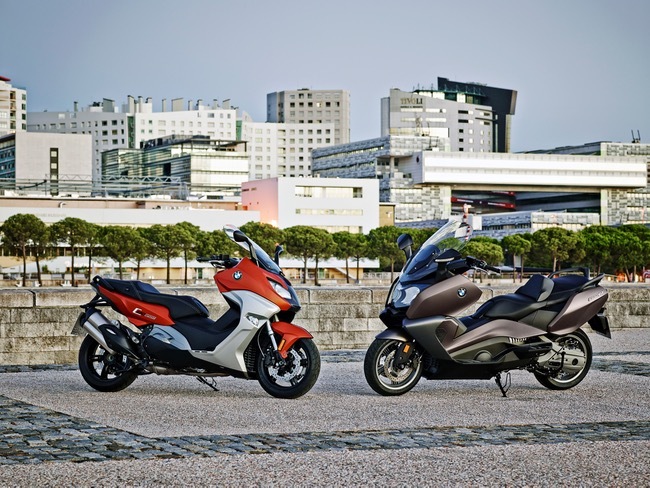 New BMW C 650 Sport and C 650 GT maxi scooters offer practical and efficient urban commuting with long distance sports performance and touring comfort. Retuned twin cylinder 647cc engine and significantly upgraded CVT delivers more responsive acceleration, higher 180km/h top speed and EU4 emission compliance. All new body design for C 650 Sport offers a sharper sports-focussed aesthetic and greater visual differentiation to C 650 GT grand tourer. New Automatic Stability Control (ASC) and Anti-lock Braking System (ABS) standard on both models. New automatic LED daytime riding light available as part of an optional Highline package for both models that also includes seat heating, heated grips and tyre pressure monitoring. Building on the strength and history of the BMW Motorrad brand and its outstanding motorcycle lineup, BMW first launched its maxi scooter C 650 range in Australia in 2012 and now with further mechanical improvements and for the Sport, a completely new body design, the range is set to appeal to a much broader market. General Manager of BMW Motorrad Australia, Andreas Lundgren said the two BMW C 650 maxi scooters combined practicality and cost efficiency with maximum riding enjoyment and touring comfort making them ideal for all environments. 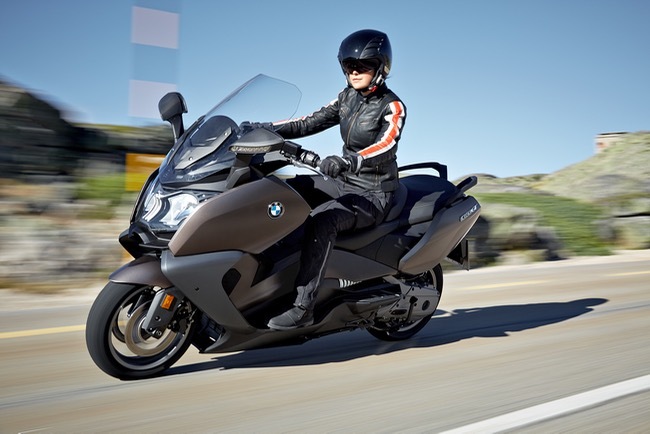 "With their improved performance, ride comfort and dynamic handling, both BMW C 650 models deliver the excellent ride qualities that BMW motorcycles are renowned for with the agility, comfort and convenience of a maxi scooter," Mr Lundgren said. "At the same time, the all-new sharper and more athletic design of the C 650 Sport offers greater differentiation to the stylish comfortable elegance of the C 650 GT tourer providing plenty of appeal for a broad diversity of customers." Both models share the same powerful 44kW/63Nm 647cc twin cylinder engine that has been retuned for improved performance and efficiency to meet the latest EU4 emission standards. Driving through a significantly upgraded Continuously Variable Transmission (CVT), the engine delivers improved off-the line response, a higher 180km/h top speed and fuel consumption of 4.6l/100km at a constant 90km/h. A new stainless steel exhaust system, now only fitted with a rear silencer, gives both scooters a throaty sonorous soundtrack. Together with the drivetrain improvements, the new C 650 models also benefit from retuned spring and damper rates for the 40mm front upside down forks and rear swing arm suspension that provides excellent highway speed stability with easy manoeuvrability in city traffic. The suspension maintains the generous 115mm travel of the previous models with the additional fine-tuning optimising the balance between sporty handling and superb ride comfort. 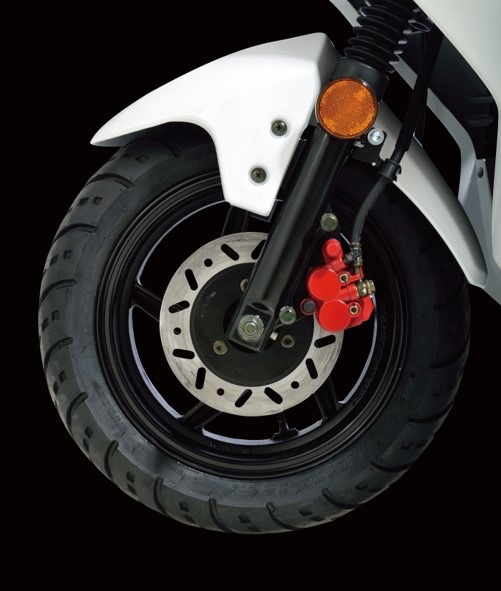 Big 15-inch light-alloy wheels further enhance the comfort, stability and agility of the maxi scooters while the new standard Automatic Stability Control (ASC), in addition to ABS, delivers maximum safety when braking or under throttle. The new C 650 Sport that replaces the previous C 600 Sport, is immediately recognisable thanks to its leaner streamlined aesthetic with a sculpted front fairing, visible forks and sharply raked windscreen sitting atop the distinctive BMW "split-face". In side profile, a dynamic line rises to the rear where the highly visible swing arm, white painted rear spring for the spring strut, and twin pipe silencer on the right hand side enhance the sporty silhouette and define the C 650 Sport as a product that sits easily within the BMW Motorrad family. The design of the C 650 GT has been fine tuned as well with new rear side trim panels and rear LED light unit while both models feature redesigned instrument dials for better readability in all light conditions. 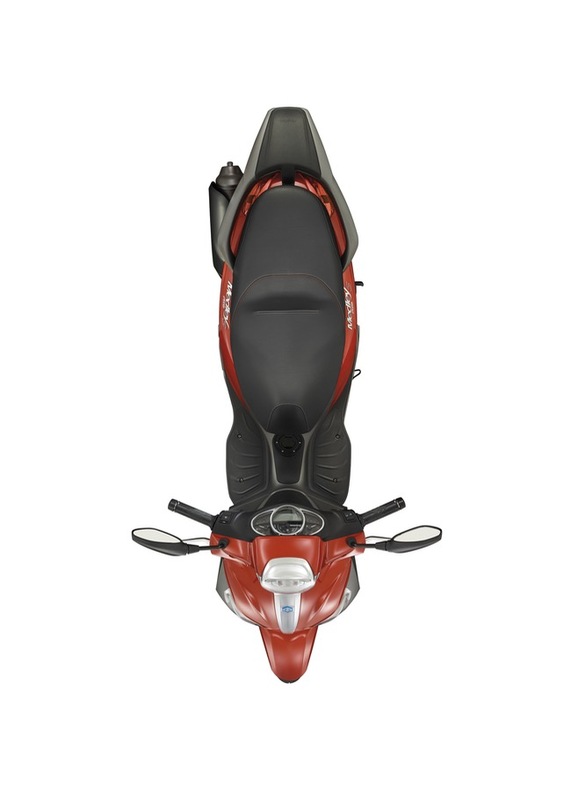 The distinction between the two models is also evident in the handlebar design with Sport's wider flatter bars and streamlined seat design prompting a more forward oriented riding position while the higher bars and large comfortable seat with an integrated backrest on the GT are perfect for long distance cruising. Both new C 650 models also offer an extensive list of practical comfort and convenience features and ample storage space. Standard adjustable windshields, with electric control for the C 650 GT, an automatic park brake that is activated when the side stand is folded down, and a revised design for the centre stand that requires 30 per cent less effort to jack up all ensure the C 650 is very easy to live with. With an LED-illuminated, 60-litre storage space under the seat, the C 650 GT offers best in class storage that is complemented by two front glove compartments, one of which features a standard power socket and automatic locking function. 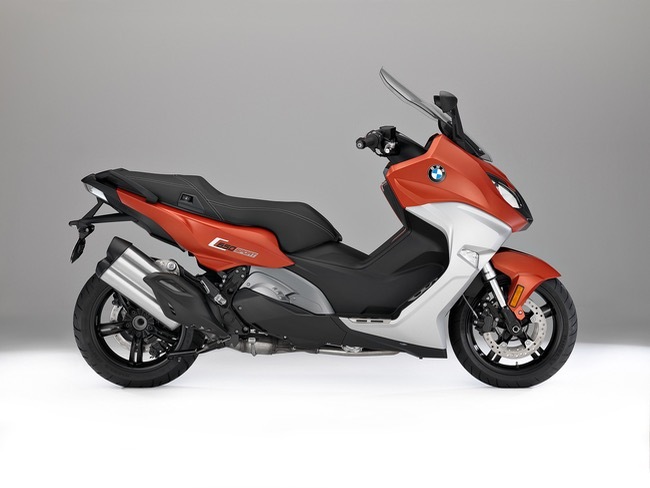 While the Sport model's slender rear end offers a smaller storage space, BMW's innovative Flexcase concept that enables a downward extension of the base of the storage compartment when the scooter is parked ensures there is still sufficient room to securely store two helmets. * Manufacturer's Recommended List Price is shown and includes GST but excludes dealer charges, stamp duty, statutory charges and on-road charges, which are additional and vary between dealers and States/Territories. Customers are advised to contact their nearest BMW dealer for all pricing inquiries. Visit BMWmotorrad.com.au to find your closest dealer. 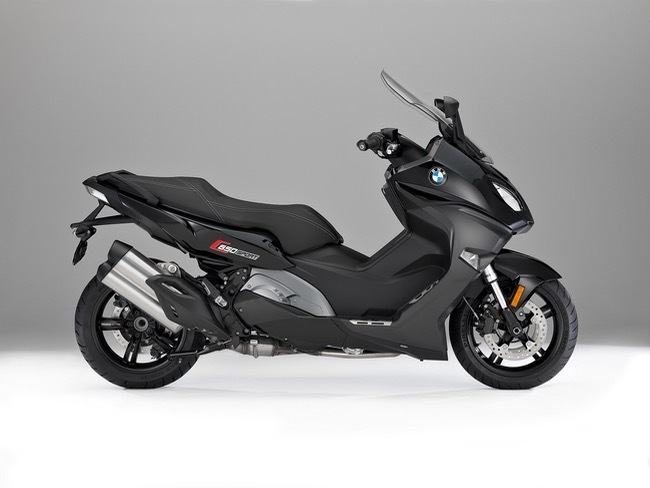 As an integral part of the BMW Motorrad range, the new C 650 maxi scooters are stylistically defined by a similarity to their motorcycle kin with a contemporary dynamic aesthetic and premium finish. That kinship can be seen in such features as the front upside down forks, rear single-sided swing arm suspension and dual front brake discs - all of which are clearly visible - together with the characteristic BMW front "split face". Visually, the new C 650 Sport offers a significantly leaner and more athletic appearance compared to its C 600 Sport predecessor with all new bodywork and a slightly longer 25mm overall length. Built around a steel tubular frame sitting on a 1591mm wheelbase, the C 650 Sport measures 2180mm long and 877mm wide including mirrors with a seat height of 800mm. An optional 780mm low seat is also available. At the front, the pronounced V shape, angular symmetrical headlights and sharply-raked adjustable windshield give the BMW C 650 Sport a strong and agile appearance. This is carried through the streamlined sculpted front fairing and side body panels in contrasting colours to the slender tapered rear end with its luggage mount atop the LED taillight. This sporty design flair is reflected in the three new colour choices available for the C 650 Sport being Valencia Orange Metallic Matt, Blackstorm Metallic and a solid Light White. Designed as a comfortable tourer, the C650 GT maintains its stylish elegance that has been further refined with new rear side trim panels, handlebar trim and LED rear light unit. With its higher handlebars, larger electrically adjustable windshield and higher rear vision mirrors, the C 650 GT offers a more upright and relaxed riding position suited to comfortable extended periods in the saddle. Given its cruising focus, the C 650 GT is 55mm longer and 39mm wider than the Sport with an overall length of 2235mm and width of 916mm with a slightly higher 805mm seat height. Like the Sport model, the C 650 GT is offered in three new colours with contrasting panels including the Blackstorm Metallic and solid Light White with a classy Frozen Bronze Metallic as the third colour option. Both new BMW C 650 models benefit from a redesigned circular instrument cluster with the analogue speedometer featuring a new scale and orange-coloured lighting for superb readability in all light conditions. 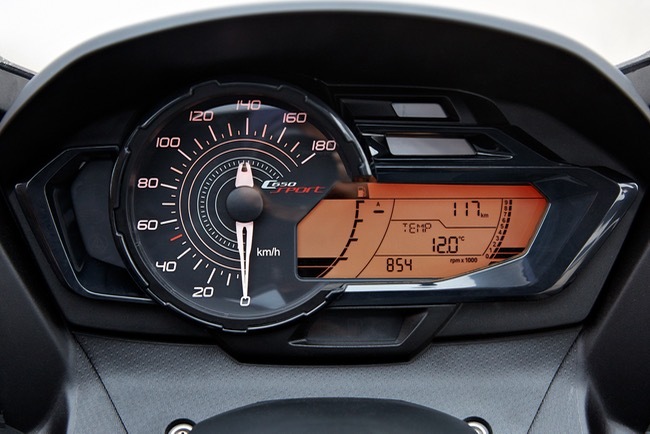 Likewise, the large LCD screen with its integrated engine speed display and fuel gauge also features orange lighting while the entire instrument cluster with integrated indicator lights has been designed to ensure minimal reflection in the display. The large seats and rear grab handles have also been further refined to improve aesthetics and practicality with both models able to comfortably accommodate two people with large footboards for the pillion passenger on the GT and fold-down foot pegs on the Sport. Securely parking the scooters has also been made easier with a revised design for the centre stand requiring 30 per cent less effort to jack the scooter up. 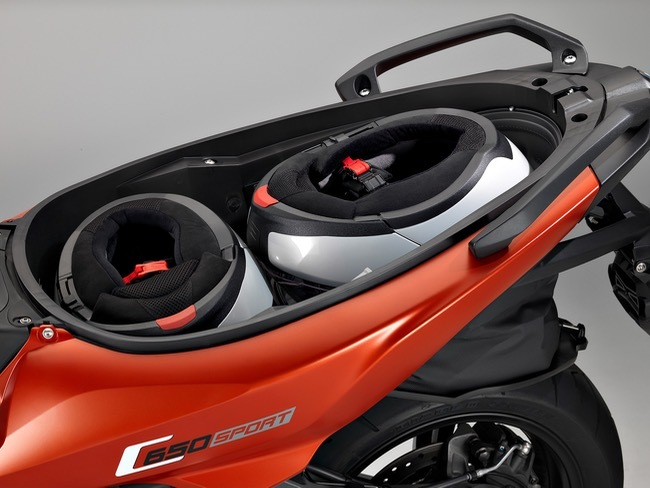 Both the C 650 models also offer generous LED-illuminated storage capacity with a 60-litre space under the seat of the GT that easily accommodates two helmets in addition to two forward glove compartments, one with a standard power socket and automatic locking function. The leaner Sport model also includes the two forward compartments while the underseat storage features BMW's innovative Flexcase. 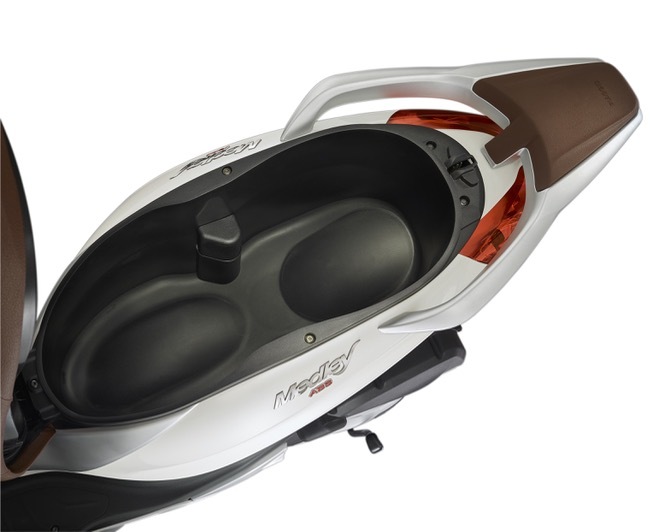 When the scooter is parked, a drop down flap connected to the base of the storage unit with a pliable, waterproof Kevlar-based material extends downward enabling the storage of two helmets. 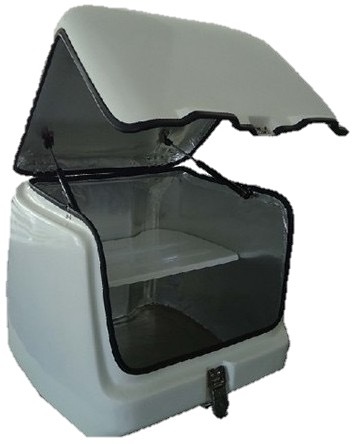 When travelling the Flexcase is folded up with the unit fitted with a safety switch to prevent the engine from being started if the Flexcase is open. 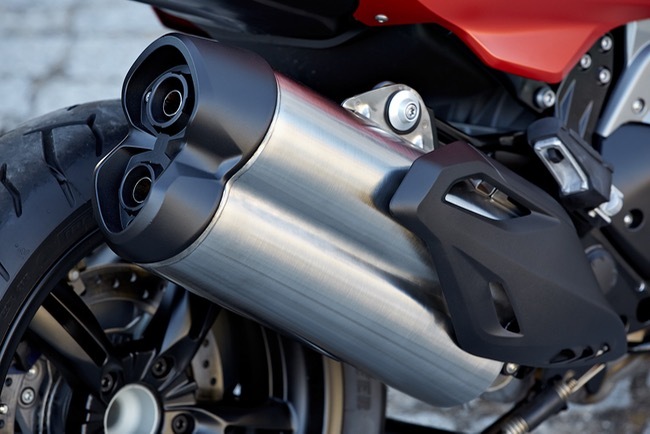 While the new BMW C 650 Sport and C 650 GT continue to use the same 647cc parallel twin cylinder engine as the previous model, refinements to the engine, a new exhaust system and in particular, substantial modifications to the Continuously Variable Transmission (CVT) have resulted in improved performance and full compliance with the latest EU4 emission standard. Generating a maximum power of 44kW at 7750rpm and peak torque of 63Nm at 6000rpm, the double overhead camshaft, four-valve electronic fuel injected engine provides superb performance and efficiency with a top speed of 180km/h and fuel consumption of 4.6l/100km at a constant 90km/h. 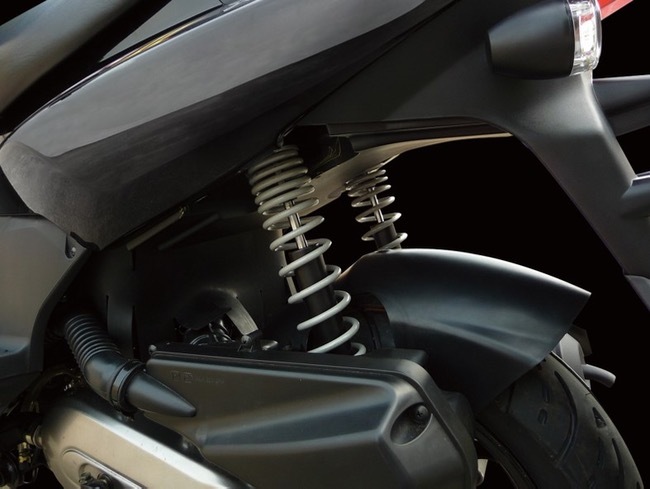 To provide a low mounting position and centre of gravity, the engine's cylinder bank is tilted forward by 70 degrees while the highly efficient cooling system with an aluminium radiator provides reliable and effective heat dissipation in all conditions ensuring optimum comfort for the rider. For the new model C 650 maxi scooters, the CVT has undergone significant modifications with revised clutch components and a broader transmission ratio spread that has increased from 2.42 to 2.95 providing more optimal use of the engine's power. This has resulted in improved acceleration, particularly off the line and at low engine speeds, along with a 5km/h increase in top speed compared to the previous C 650 GT/C 600 Sport. Like the previous models, the new exhaust system is made of stainless steel but with only a rear silencer and no front silencer, it provides the C 650 with a particularly full sound. 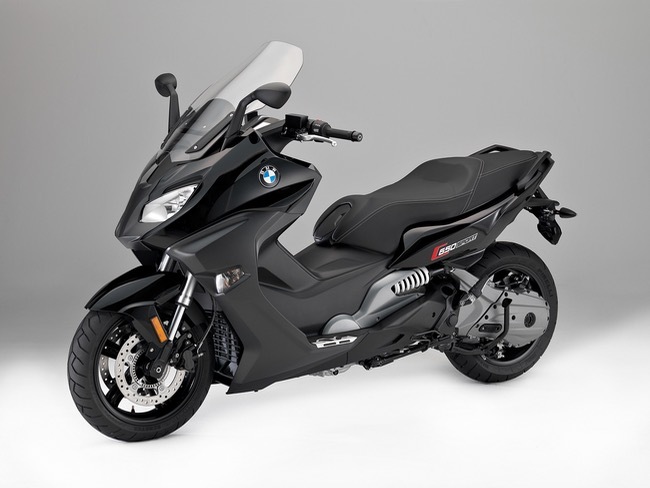 In order to deliver trademark BMW ride comfort and dynamic handling, both the new C 650 Sport and C 650 GT feature a suspension set up that is more reminiscent of its motorcycles than other scooters. 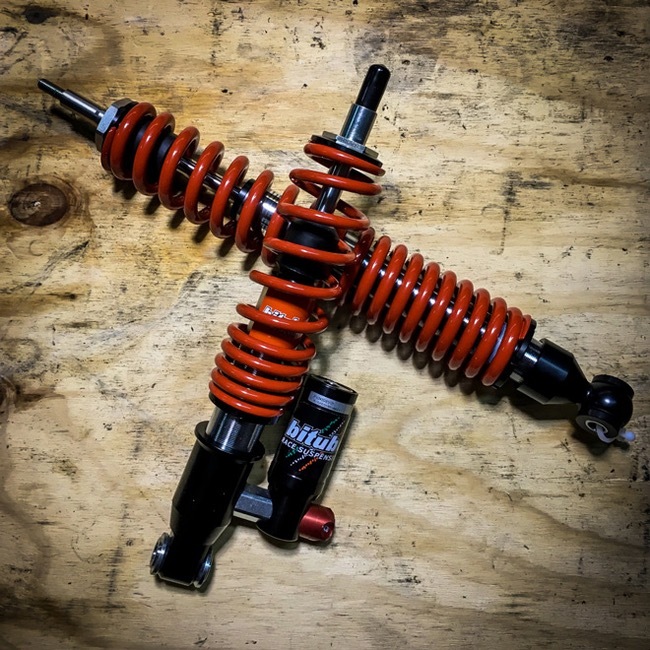 At the front the upside down forks feature a generous 40mm tube size while spring rates for both models have been reduced by ten per cent to fine tune the balance of handling and ride comfort. The rear suspension continues to use a torsionally rigid die-cast aluminium single swing arm that has also been retuned for the new models to ensure maximum directional stability. At the same time, with 115mm of spring travel at both the front and rear, the C650 provides outstanding comfort over all road conditions. Aiding the comfort, agility and excellent handling of the C 650 models are large five-spoke 15-inch alloy wheels fitted with 120/70 R 15 tyres at the front and wider lower profile 160/60 R 15 tyres on the rear. In true BMW Motorrad tradition, the new C 650 Sport and C 650 GT are both fitted with superb brakes to ensure the highest levels of safety in all road and weather conditions. At the front are twin 270mm discs with a single 270mm disc on the rear with both fitted with dual piston floating calipers. The grip width of both brake levers can be adjusted across five different settings to provide efficient ergonomics tailored to individual riders and both models are fitted with the latest Bosch two-channel anti-lock brake system that monitors front and rear brakes independently. 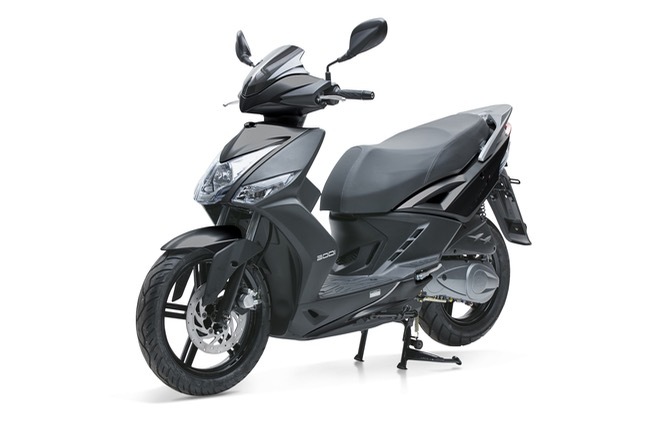 The new maxi scooter models also feature as standard an Automatic Stability Control system that reduces engine torque when drive slip or a loss of traction is detected by the engine management system. As well offering an outstanding riding experience, the C 650 models feature a range of clever innovations and equipment to deliver superb comfort, convenience and safety. In the cockpit, the instrument cluster with its circular analogue speedometer and large LCD screen provides a range of information including a comprehensive trip computer that displays such things as average fuel consumption and speed and distance to empty from four litres of fuel, along with date and time, temperature, warning messages and service information. Automatic functions also improve convenience with the C 650 models featuring an indicator reset function that automatically deactivates the turn signals after 10 seconds or a distance of 210 metres. Another clever innovation fitted as standard to the C 650 Sport and C 650 GT is the automatic park brake activated by the side stand. When the stand is lowered, a cable automatically locks the rear brake caliper providing secure parking on all gradients. Both models are available with an optional Highline Package that further enhances the comfort and convenience. The package incorporates seat heating, heated grips, tyre pressure monitoring, white LED indicators (Sport only) and automatic daytime running lights. When activated, the LED daytime running lights automatically switch between the daytime function and low beam including the front parking light when the light falls below a certain level such as when travelling through a tunnel. In addition to Highline Package, other options include an alarm system, a vast range of storage accessories, canopies and covers, BMW Motorrad navigation systems, and smartphone cradle and USB charger to connect to the standard 12V power socket in the front storage compartment. For more information or to find your local BMW Dealer visit BMWmotorrad.com.au. Piaggio Medley is the new easy scooter, fully loaded and technologically advanced, that combines the benefits of a lightweight high wheel with the comfort and features of a superior class scooter. 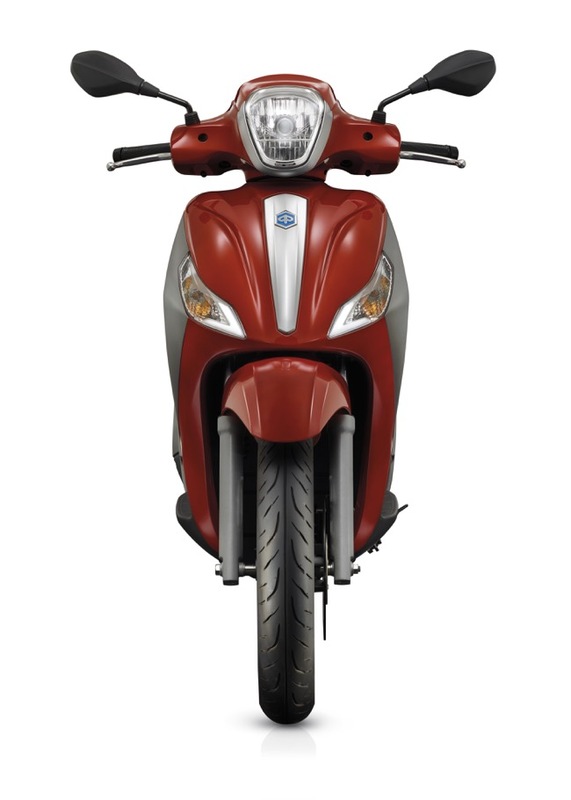 Piaggio Medley is powered by the new iGet 125 and 150cc engines, electronically fuel injected, liquid cooled and with 4 valve timing. A new family of single cylinder engines that raises the bar in terms of quality, reliability and emissions containment. Start & stop, ABS, “light guide” technology, record cargo capacity: Piaggio Medley was born to be a leader, embodying the values of quality, style and technology. The agility of a metropolitan vehicle combined with the dynamic character of a high wheel and the convenience and cargo capacity of a large scooter resulted in the Medley, the new Piaggio that combines ultra-modern values of rationality, technology and style. Medley blends practicality, technical innovation and beauty in the purest Italian style, fully comprehending the continuously evolving needs of a public in search of mobility solutions that go beyond the usual scooter formula. With Medley nothing is sacrificed. 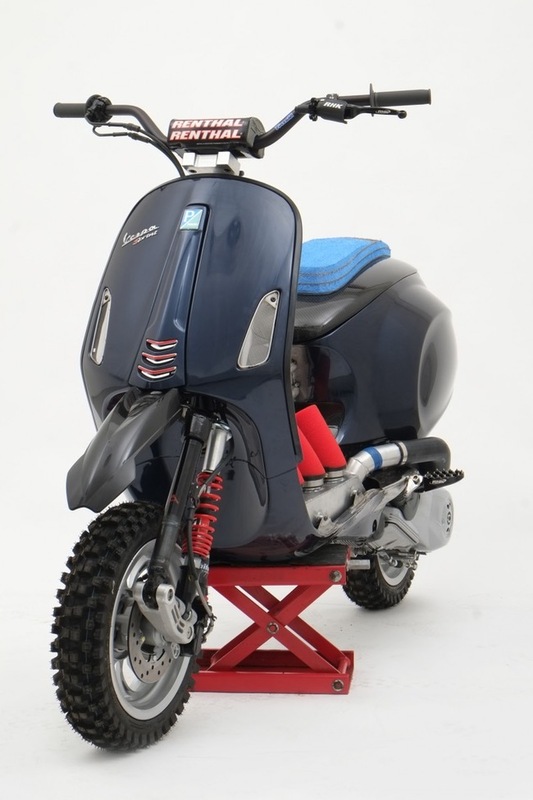 Piaggio Medley skilfully combines the benefits of a chassis characterised by large diameter wheels, which guarantee superior rideability and road holding compared with smaller wheeled scooters, and the benefits of a classic scooter, its protection, its cargo capacity and the comfort of its large saddle when riding two-up. The high wheel scooter has been very successful, divided up into lightweight and manoeuvrable vehicles characterised by an easy ride and economic operating costs, and more substantial sized vehicles with qualities such as sturdiness and performance. Piaggio, the European leader among major global scooter manufacturers, a company with a unique heritage as the creator of new forms of light mobility, has been an innovator in the high wheel segment with both easy and lightweight scooters such as the Liberty, as well as with scooters that have spectacular performance and exclusive technical features such as the Beverly range. Medley achieves the goal of creating a new class of Piaggio high wheel scooter that combines the benefits of an agile and lightweight scooter with those of a larger and higher performance high wheel. 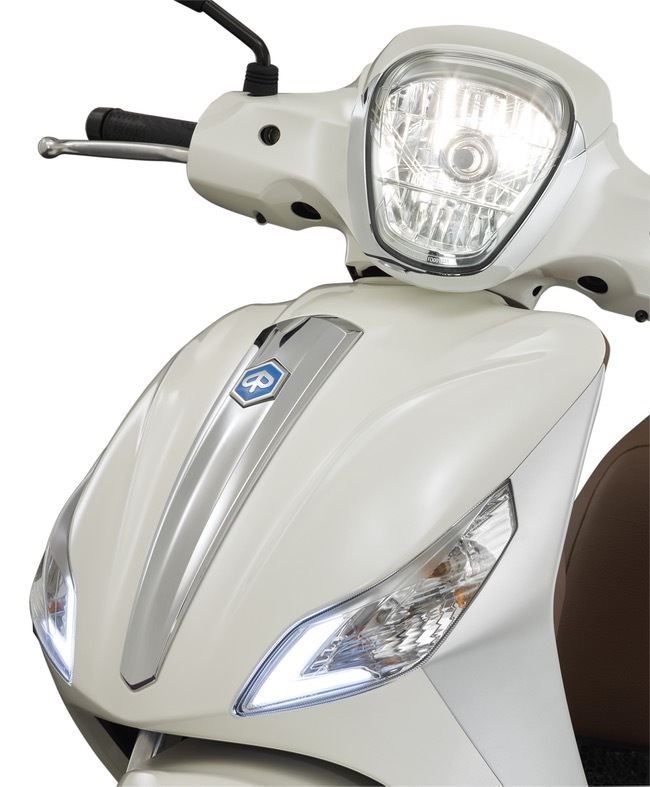 Coming standard with the “Start & Stop” feature which, by managing engine switch-off and start-up during stops, contributes to containing fuel consumption and emissions as well as two-channel ABS, Piaggio Medley therefore boasts an equipment package that is normally reserved for superior class scooters. Two 4-stroke engines from the new i-get family are available - 125 and 150 cc - both liquid cooled with 4 valve timing and electronic fuel injection. 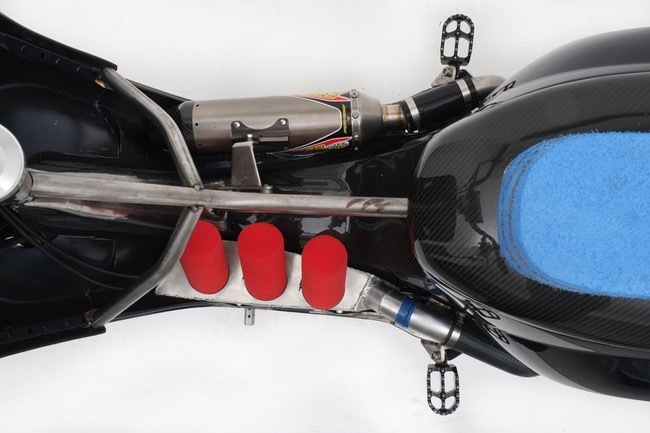 This is a new family of engines designed and developed by Piaggio which boasts a scooter engine research and development centre, one of the most advanced in the world. The bearing structure of the Piaggio Medley is based on a new “low single cradle” type frame made of steel tubing reinforced with pressed steel that contributes to its overall sturdiness, maintaining a low and convenient seating position. The front end is characterised by a fork with 33 mm stanchions in diameter, whereas a pair of double acting shock absorbers and coil springs with preload adjustable to 5 positions work at the rear axle. Thanks to this configuration, to the large wheel rims (16” front and 14” rear) made of aluminium alloy with an elegant six split spoke design and the tyres (100/80 front and 110/80 rear), Piaggio Medley guarantees riding comfort, road holding and stability worthy of higher class vehicles, while the contained weight, 132 kg kerb weight, allows the rider to maintain all the agility and manoeuvrability that are the strong points of lightweight scooters. The powerful braking system handles active safety - made up of two 260 and 240 mm disc units with double piston floating callipers - with ABS as standard equipment. Each wheel has a sensor and a tone wheel to detect revolutions which instantly reads the speed and deceleration of the wheel with respect to that of the vehicle. 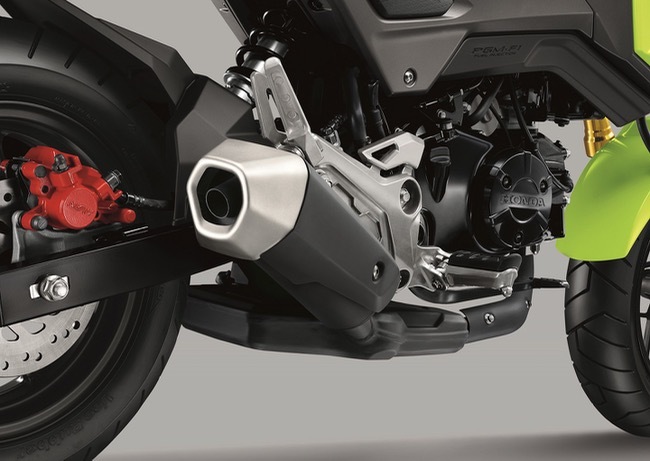 The sensors dialogue with a 2-channel hydraulic control unit which activates the ABS system if one of the two wheels decelerates abruptly with respect to the vehicle, avoiding locking and ensuring stability and efficient braking even on road surfaces with a low friction coefficient. 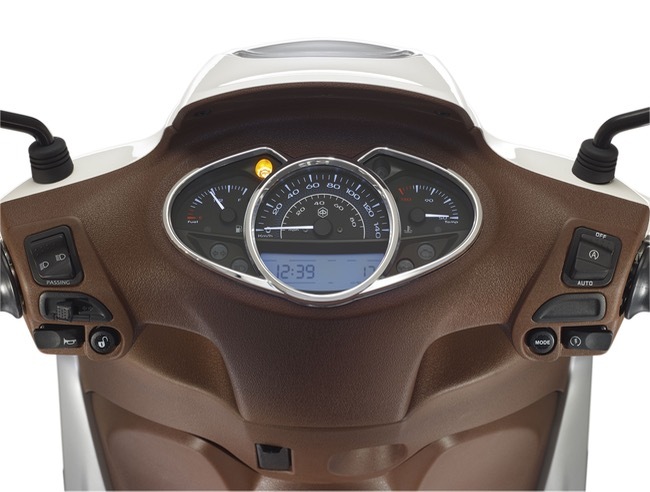 Piaggio Medley is also equipped with a “tilt sensor”, a safety device that deactivates the Start & Stop system, switching off the engine, in the event of a fall. As occurs in the automotive field, in the two wheel sector the combination of different vehicle architectures also leads to the birth of new lightweight mobility formulas. Inspired by the important, modern and elegant lines of the bigger sibling Beverly, the new Piaggio Medley introduces concepts of light weight and dynamism that are ideal for city use of the vehicle. The 16” front wheel, in addition to providing stability, safety and comfort, vertically streamlines the entire front end. The wheel rims are aluminium and boast an elegant six split spoke design. 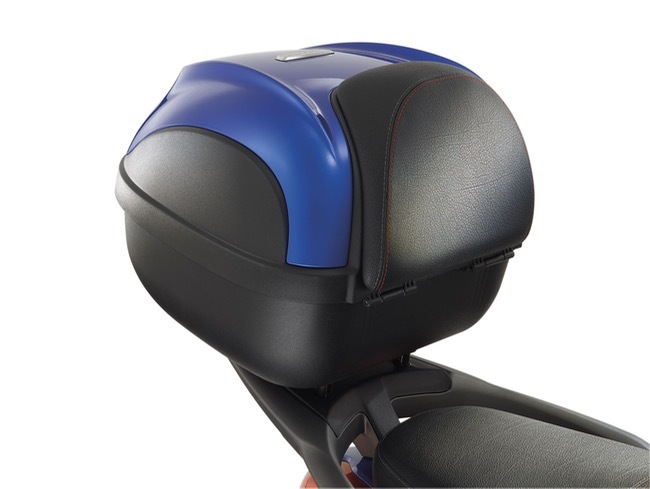 The front shield has a spacious glove compartment that can be easily accessed from the rider's seating position. 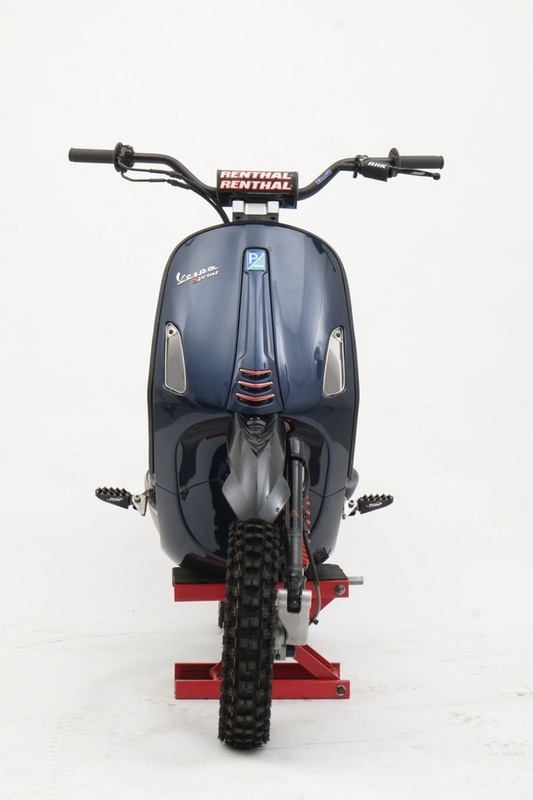 The front view stands out from the classic high wheel scooter look. 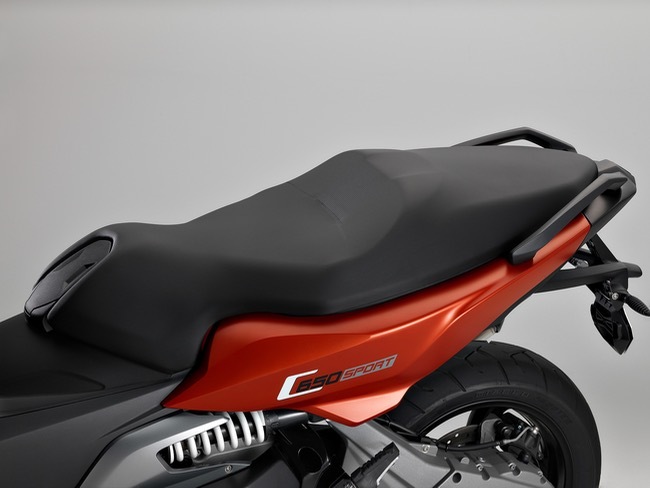 The surfaces are more extended, all to the advantage of aerodynamic protection and therefore riding comfort, although Medley maintains a clear lightweight look which, combined with the most classic Piaggio style re-interpreted in a modern key, gives the vehicle a unique and distinctive personality. 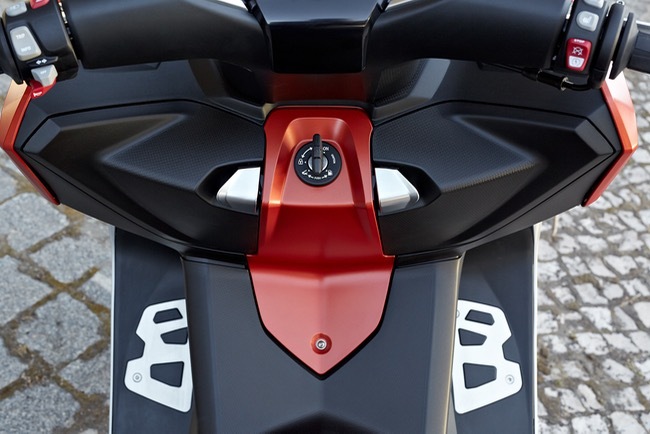 The metallic vertical element (the “tie”) stands out in the centre of the front shield, thereby accentuating a certain family feeling with recent Piaggio production. Also, the innovative LED daylight running lights and headlight become true somatic distinctive traits. The handlebar, shaped to guarantee protection of the rider, houses a refined instrument cluster with a chromium frame. 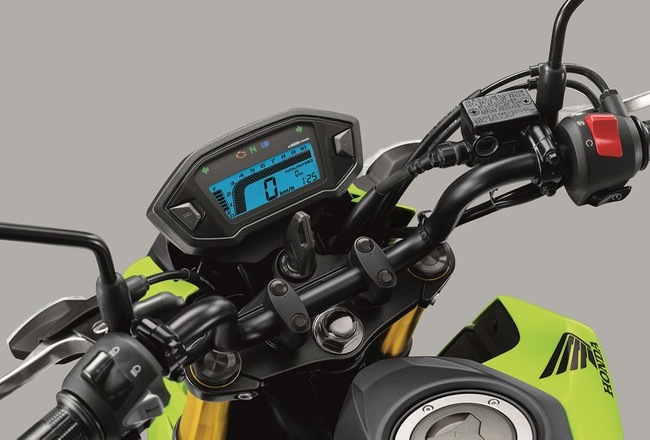 The digital display makes a complete set of information available (total and trip odometer, external temperature, “service” icon, digital clock, battery status icon and ice danger icon), all selectable using the Mode button on the right hand electric block, while the complete arrangement of warning lights keeps tabs on all the functions, starting with the “Start & Stop” feature, that can be deactivated using the right hand electric block, and then moving along with the classic “injection check”, fuel reserve, oil pressure, ABS activation and Immobiliser indicators. 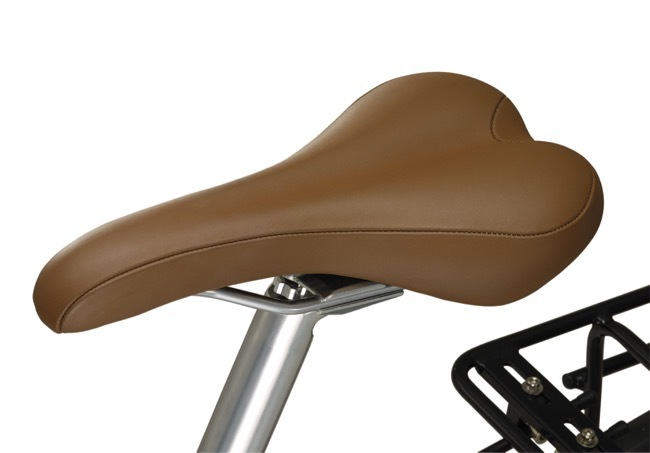 The saddle, large and comfortable even on the passenger section, has an electric opening latch controlled from a button on the handlebar as well as the traditional mechanical latch located in the leg shield back plate glove compartment. The style of the glove compartment is coordinated with the rear part of the handlebar and the saddle, recreating an area similar to a car dashboard and there is even a USB socket inside, useful for charging your smartphone. There is also a convenient, retractable bag hook in the leg shield back plate. Along the entire body of the Medley the alternating concave and convex surfaces, guided by decisive and arched lines, gives the vehicle a dynamic, but compact look. A rear light cluster with daylight running lights achieved with red LEDs and opalescent diffraction type optics brings the shape of the vehicle to an original end. Even in night riding conditions, as with the front daylight running lights, the guided light in classic Piaggio style makes the vehicle unique and recognisable. The rear end, particularly sleek, maintains contained dimensions despite the large helmet compartment with an amazing 36.2 litres of space, enough to hold two flip up helmets, truly exceptional for a high wheel. This result is obtained thanks to the well designed shape of the tail and the repositioning of the fuel tank at the centre of the footboard. It is a solution that increased cargo capacity in the helmet compartment, providing further benefits such as the possibility of refuelling without dismounting and better rideability on the road because of the improved weight distribution, now more centralised. Piaggio Group motoring technology has always aimed to create increasingly more advanced powerplants in terms of low fuel consumption and emissions (including noise), as well as increasing service intervals. Armed with the most important engine and scooter research and development centre in Europe, and one of the best in the world, Piaggio has developed unique technologies and skills in house that contribute to the construction of engines today which are in line with the strictest standards in the world. 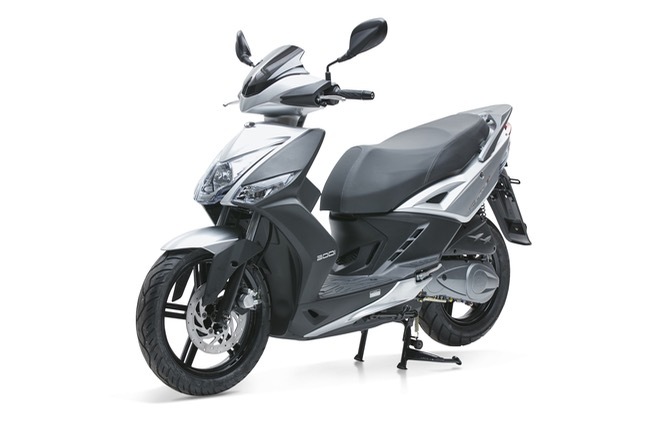 On Piaggio Medley a new family of engines called i-get is introduced, available in 125 and 150 cc engine with electronic fuel injection, four valve timing and liquid cooling. These are engines at the top of their respective categories in terms of performance and environmental friendliness. The new Piaggio patented Start & Stop system called RISS (Regulator Inverter Start & Stop System) also makes its début on the new scooter. This system, the result of Piaggio's technological know-how, does away with the traditional starter motor, which is replaced by a brushless “direct mount” electrical unit, in other words, installed directly on the crankshaft. This provides several benefits: extremely quiet start-up, lighter weight and more reliability, less fuel consumption. The Piaggio Start & Stop automatically switches off the engine 3 to 7 seconds after the vehicle stops (depending on whether or not the engine has reached the correct operating temperature). A slight twist of the throttle instantly restarts the engine, in complete silence, given the absence of the traditional starter motor. If the side stand is lowered or if the tilt sensor is activated, the ECU bypasses the Start & Stop function. 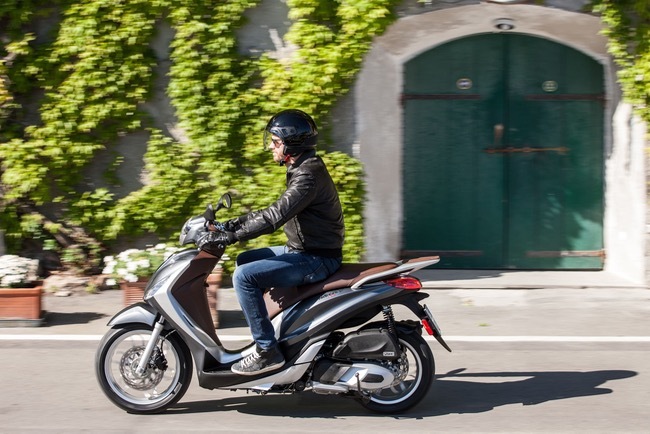 The new Piaggio i-get power-plants are the result of a design philosophy that sets new and more advanced quality and reliability levels as its primary objectives. Every aspect of the design was aimed at optimising the efficiency of each individual part in order to contribute to maximising performance. In the initial testing phases alone more than one million kilometres were logged in the intense search for reliability. Each and every one of the new engines' components, from the exhaust to the internal design of the gearbox cover, all the way to the new air filter, has been designed to make the ride smoother, quieter and more comfortable, and to increase the life of the engine. A large portion of the Piaggio technical work had to do with the maniacal attention to reducing friction through the introduction of bearings on every rotating part, in the timing and in the crank gear geometry, with the cylinder axis shifted to reduce losses due to friction on the piston. The mechanical noise of the new i-get engines is also extremely low thanks to a reduction in play and an optimisation of the materials and shapes. thermodynamics (head, cylinder, piston, rocker timing with rollers); also, all of the parts in motion have been optimised to reduce weight and operating friction. the crankshaft, for a clear reduction in vibrations. starter: no longer the classic gear drive starter motor, but now an electric “direct mount” type “brushless” motor on the crankshaft. The result is the total absence of friction in order to obtain a quiet, durable and reliable starter. cooling system, with radiator built into the engine: this reduced the overall weight of the vehicle and the warm-up times (thermal management), with clear benefits in terms of consumption and emissions. the gearbox cover, to reduce the noise even more. the latest generation double toothed belt to minimise passive losses, once again all to the advantage of consumption and emissions. the gearbox setting that improves rideability, performance and consumption. 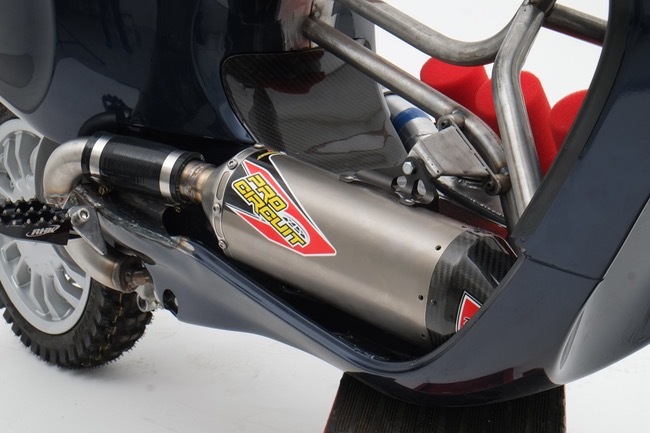 the air filter, which improves filtering action to reduce intake noise. new built-in engine electronic control unit with the S&S management part (Alternator, S&S Inverter, RISS), entirely developed by Piaggio. The eighth-litre version is credited with power of 9 kW at 8,250 rpm, whereas the more powerful 150 cc puts out 11 kW at 7,750 rpm. These are numbers that translate into quick engines on the road, specifically designed and built bearing in mind the needs of the rider for daily use in city and metropolitan environments. These are riding conditions characterised by frequent starts and stops which require elasticity, quick acceleration and a smooth ride. These characteristics are ensured by excellent torque (11.5 Nm at 6,500 rpm for the 125 cc and 14.4 Nm at 6,400 rpm for the 150 cc) which provide Medley with excellent acceleration both from a stop and in motion, partially to the credit of the truly low overall weight. The new Piaggio Medley engines guarantee lengthy service and maintenance gaps. Fluids and filters are changed every 10,000 km and valve clearance only needs to be adjusted every 20,000 km. Overall fuel consumption benefits from the optimisation of each and every component: mileage on the WMTC cycle reaches 47.5 km/l for the Medley 125 (45.9 km/l for the Medley 150). 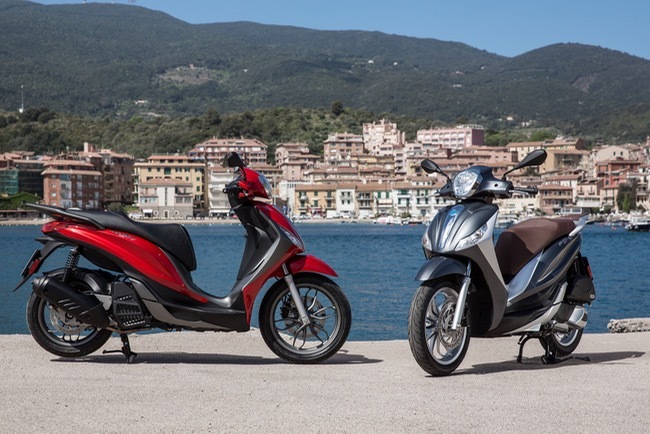 The new Piaggio medley is available in two versions. Medley and Medley S. The latter stands out for the use of the more sporty anthracite grey colour on the trim, such as the wheel rims, the passenger grab handle and the upper plastics on the footboard. The Medley S colour variants are: Rosso Ibis, Nero Grafite and Blu Sport (all with black saddle and interior). 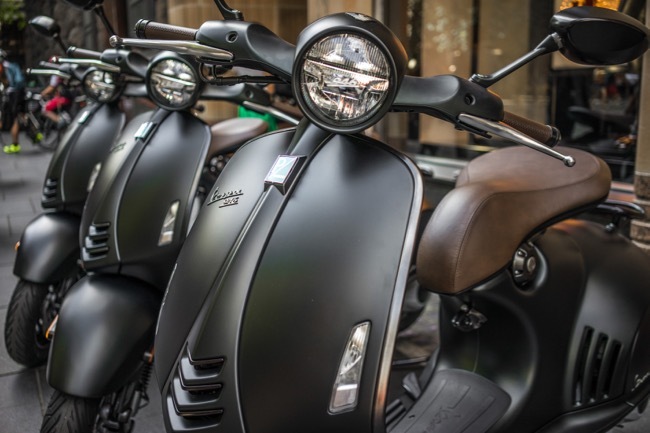 Piaggio Medley, on the other hand, favours more traditional and elegant colours, such as Bianco Perla, Grigio Titanio (both with brown saddle and interior) and Blu Midnight (with black saddle and interior). 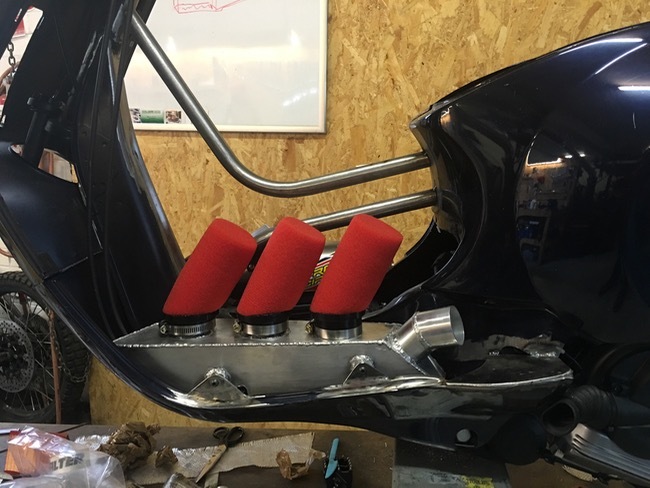 These colour schemes are combined with aluminium colour trim (such as the wheel rims, the silencer heat shield, the passenger grab handle and the upper plastics on the footboard). 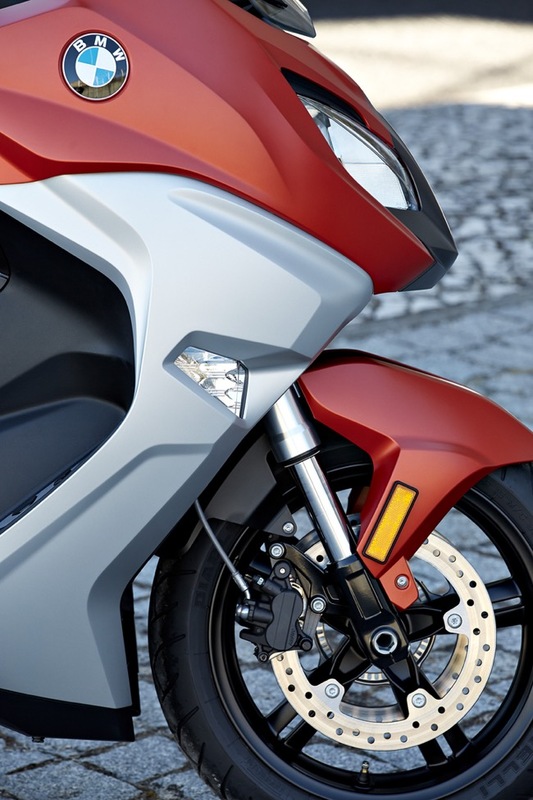 The line of accessories for Piaggio Medley is born under the sign of technology at the service of functionality. 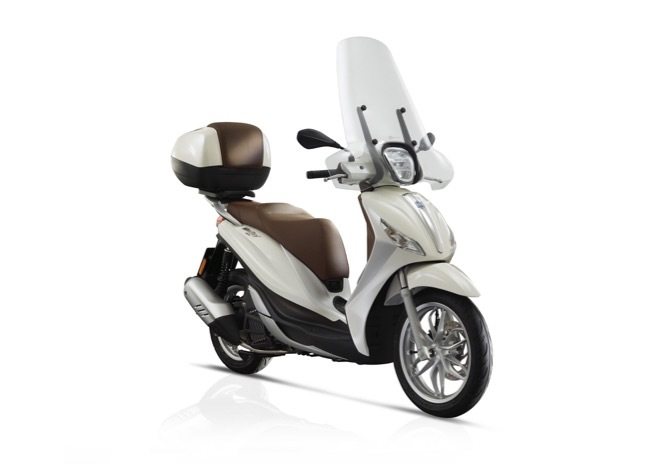 It is a complete line of accessories designed for the Piaggio Medley which increase comfort and potential uses. 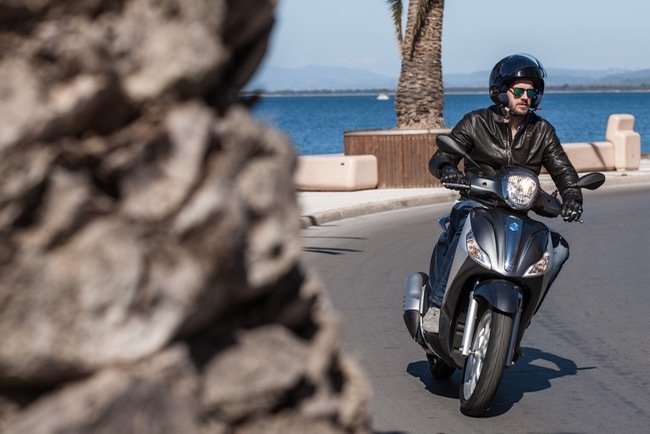 The lines, materials and refinement of the windshield give the new Piaggio scooter the best possible protection against the weather, also accentuating the elegance of its shape. The smaller top fairing highlights the spirit and sporty character of the Medley. Great attention was given to cargo capacity. To match the spacious helmet compartment, Piaggio offers the classic 30 litre top box, spacious enough for 2 Piaggio Style helmets, and the brand new 37 litre top box that further extends the maximum cargo capacity. Both of the top boxes are naturally available colour coded to match the vehicle and can be fitted with a passenger backrest. To guarantee maximum safety, the anti-slip mat can be installed. The dedicated leg cover is the ideal completion for those who ride year round. On the other hand, for those who do not use the scooter in the winter, a waterproof vehicle cover is available, dedicated and personalised with the logo, which has specific openings for the windshield and the optional top box. The line of accessories does not neglect the theme of vehicle security: the mechanical saddle-handlebar anti-theft system available for Medley is convenient and simple to use. The innovative electronic anti-theft system, which is self powered and characterised by the lowest power absorption on the market, adds the immobiliser deterrent and a powerful siren to combat any attempt at tampering. On Medley several technologically advanced systems can be installed simultaneously, such as the bike finder (to find your vehicle quickly in crowded areas and to open the saddle using the remote control), the Piaggio Sound System (a sound system to reproduce information, trip directions or music, using the body of the vehicle as a diffuser) and the Piaggio Multimedia Platform. This last item is the exclusive Piaggio multimedia platform that lets you connect your smartphone to Medley via Bluetooth, thereby obtaining even more trip information, as well as vehicle status information, in addition to a convenient geo-localisation system that makes it easy to locate your scooter even in the most chaotic areas of the city. The PMP application can also indicate engine rpm, instantaneous power and torque values, the lean angle achieved on turns, instant and average fuel consumption and the battery voltage. It also automatically provides directions to the closest petrol station when you are low on fuel, as well as indications on how to ride in order to achieve the best possible fuel consumption. All of the information displayed can then be analysed and downloaded to your computer later. No other vehicle on the market today can be equipped with the same technological features guaranteed by the Piaggio accessories range. 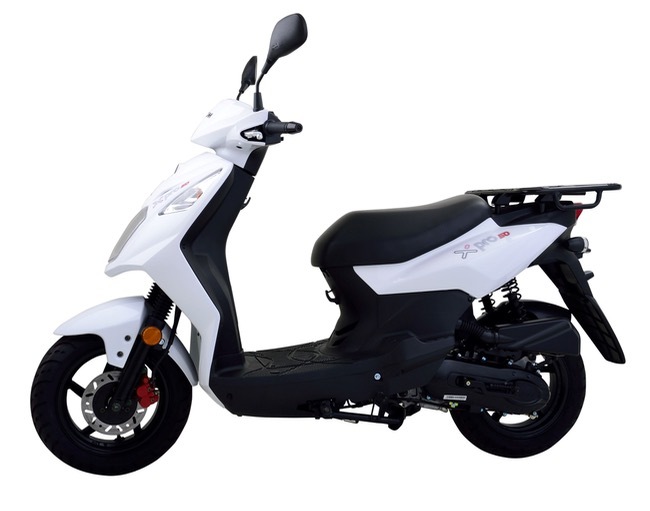 KYMCO has dropped the entry price of its Taiwanese-made Downtown 350i ABS maxi-scooter to $6,490 plus on-road costs, marking a $1,000 drop over its 2015 counterpart. The price realignment comes as part of a significant model update which offers a host of revised performance and safety features, including a fresh 320cc fuel injected engine. 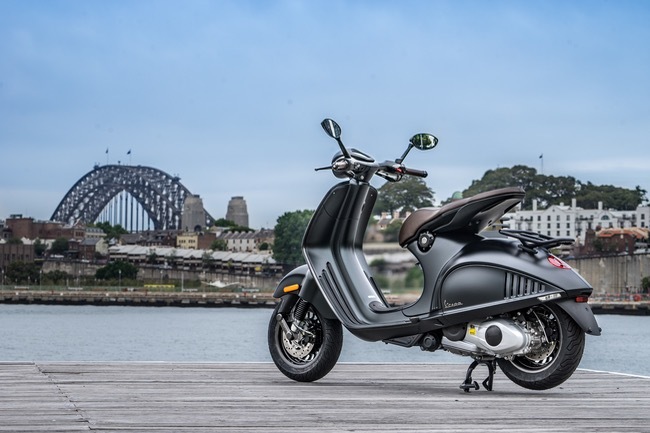 KYMCO Australia’s Michael Poynton said Downtown 350i ABS now represented better value than ever thanks to the combined price drop and enhancements. 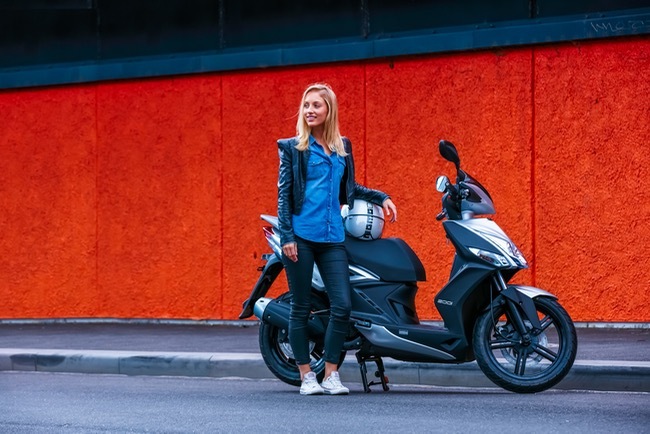 “Downtown has long been a winning package for KYMCO and our new entry-level price will further underline the formidable value that it represents. “A long list of new updates on this year’s model is another significant plus for Downtown that we expect will push it way beyond any competition in the market,” said Poynton. 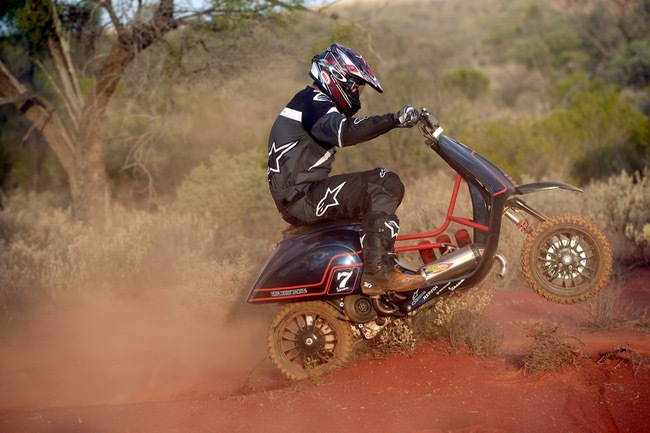 The update list is headed by a fresh fuel injected, liquid-cooled, 320cc four-stroke engine that has been carefully mapped to deliver more responsive power across a lower rev range. Aside from the new engine, buyers of the refreshed model will also note the restyled cowling and lighting features, widened foot board and smoother CVT automatic transmission configuration. Advanced safety features carry over unchanged from the previous model with Bosch ABS braking technology returning. Poynton noted the inclusion of ABS technology reflected the company’s commitment to rider safety and further demonstrated their drive toward delivering unequalled value. Other features that remain unchanged include the segment leading under-seat and in-dash storage, advanced integrated lighting with LED highlights and superior instrumentation cluster featuring LCD multifunction display. The suspension again features dual five-position adjustable rear shocks and telescopic forks to deliver responsive handling and advanced road holding ability. 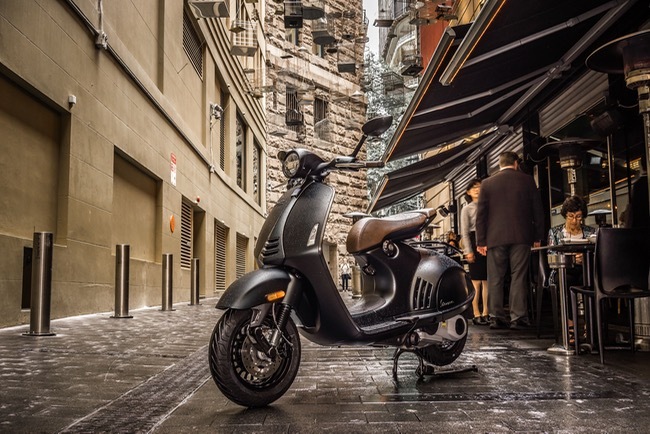 The updated Downtown 350i ABS maxi-scooter is set to roll into Australian showrooms as early as next week and is supported by the factories three-year warranty program. For you closest Kymco Dealer visit the locator at Kymco.com.au. Customers have turned to KYMCO for unmatched quality, unsurpassed capability and unequalled value for more than 50 years. With 2014 sales and revenues of more than $1.34 billion, KYMCO is a recognised global leader in the manufacture of scooters, all-terrain and utility side-by-side vehicles. A group of Taiwanese businessmen partnered Japan’s Honda Corporation to found KYMCO in 1963. The Japanese influence introduced an unrelenting focus on constant improvement and quality. In 2015, KYMCO will produce more than 1.2 million vehicles for export to 100 countries. Welcome in Autumn with the Peter Stevens scooter ride day! 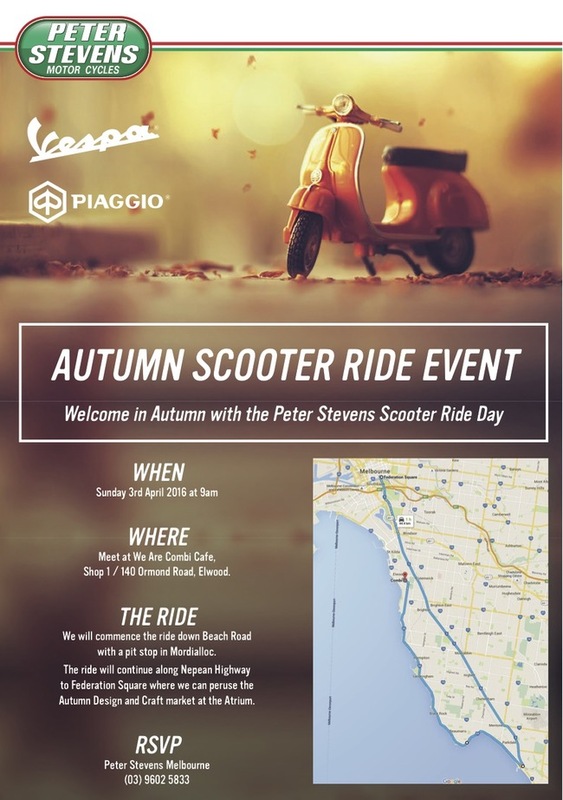 Welcome in Autumn with the Peter Stevens scooter ride day! Get out and meet fellow scooter riders for a fun Sunday ride. Meet at We Are Combi Cafe, Shop 1 / 140 Ormond Road, Elwood to enjoy a morning smoothie, coffee or both! We will commence the ride down Beach Road with a pit stop in Mordialloc. The ride will continue along Nepean Highway to Federation Square where we can peruse the Autumn Design and Craft market at the Atrium. Lightweight, hard-hitting and a whole lot of fun, the 2016 Honda Grom is like no other. Set to touch down on Australian shores mid-2016 with a special limited launch offer of just $3,999 ride-away. Lightweight, hard-hitting and a whole lot of fun, the 2016 Honda Grom is like no other. Set to touch down on Australian shores mid-2016 with a special limited launch offer of just $3,999 ride-away*, the new compact commuter is set to take the Australian market by storm. The Honda Grom has wowed riders all over the world with serious fun factor packed into a simple, lightweight design and now Australian riders will get to experience all that the fiery pocket rocket has to offer. Designed to allow all riders to experience the exhilaration of a Honda motorcycle, the funky machine boasts outstanding ergonomics that are all about excitement. 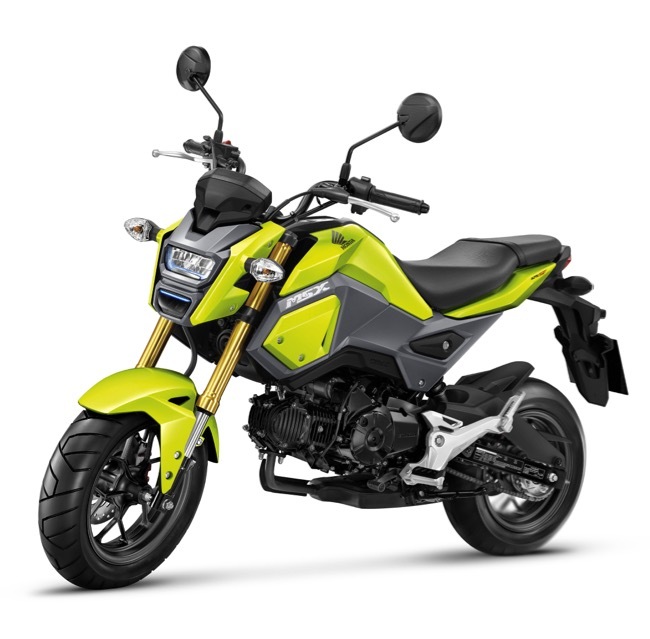 Built around Honda’s well-proven and super-efficient fuel-injected 125cc engine, the Grom delivers ample power and smooth torque with complete ease. Complementing the famed power-plant is a compact chassis that features a sturdy steel frame, inverted front fork, mono-shock rear suspension and powerful hydraulic disc brakes on lightweight 12-inch wheels. The mini-streetfighter blends exuberance and practical performance with the attitude and style to stand alone. 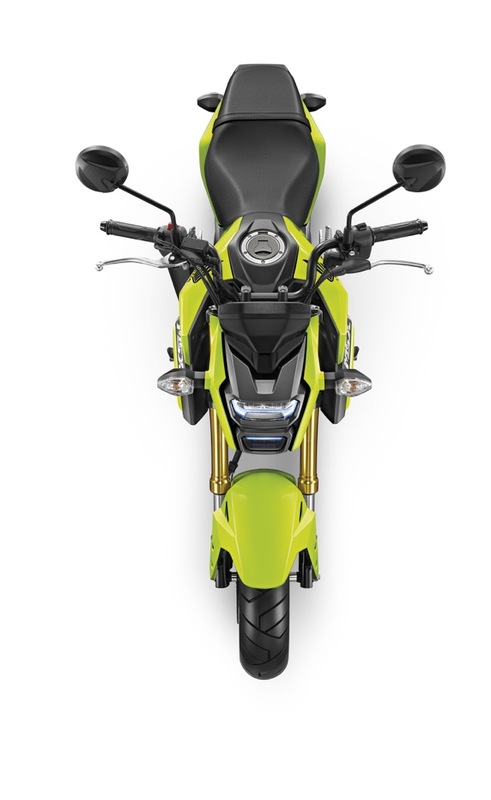 The bold stance is evident throughout the entire design, from the fuel tank and side panels that integrate cleanly to give an edgy outlook, to the unique stacked LED headlight that offers a distinctive, ultra-modern face. Completing the mischievous guise with a compact, upswept tail unit, higher pillion seat and short, under-slung exhaust, the Honda Grom means business on the streets. The punchy motorcycle will be available in Metallic Pearl Valentine Red, Lemon Ice Yellow and Matte Axis Grey when it hits Australian shores later this year. Hurry in, because the launch offer of $3,999 ride-away* is limited to motorcycles delivered before 31 July 2016. For more information about this exciting new model and to lock in your order before they sell out, visit your local Honda Dealer, call 1 300 1 HONDA or visit www.HondaGrom.com.au. *The motorcycle must be delivered by 31 July 2016 and stocks are limited. Only at participating Honda Dealers. Visit www.hondagrom.com.au for full terms and conditions. The funky and compact Honda commuter that has taken the world by storm is coming to Australia. The funky and compact Honda commuter that has taken the world by storm is coming to Australia. 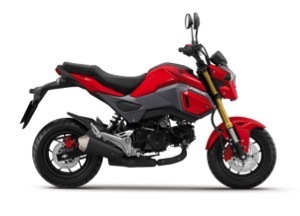 The Honda Grom has wowed riders all over the globe with serious fun factor packed into a simple, lightweight design.The funky and compact Honda commuter that has taken the world by storm is coming to Australia. The Honda Grom has wowed riders all over the globe with serious fun factor packed into a simple, lightweight design. The popular pocket rocket is due to land in Australia mid-2016 and promises to offer an exhilarating machine that anyone can master. 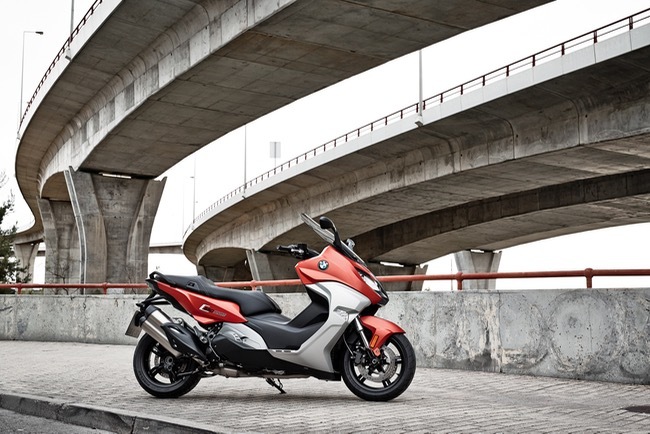 The award-winning motorcycle boasts outstanding ergonomics that are all about fun. Between its user-friendly design and unique styling, the Grom is sure to be a hit. The punchy motorcycle will be available in Burning Red, Hyper Yellow and Eclipse Black when it hits Australian shores later this year. 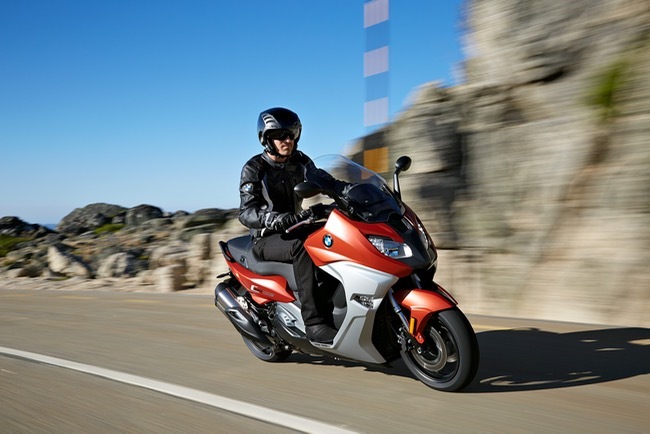 For more information about this exciting model, visit your local Honda Dealer, call 1 300 1 HONDA or visitwww.hondamotorcycles.com.au. 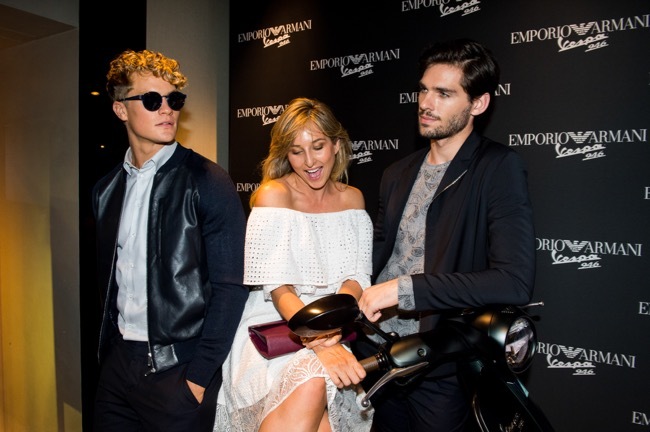 We are pleased to announce that, Vespa 946 Emporio Armani has officially launched in Australia by a private cocktail in Emporio Armani boutique. 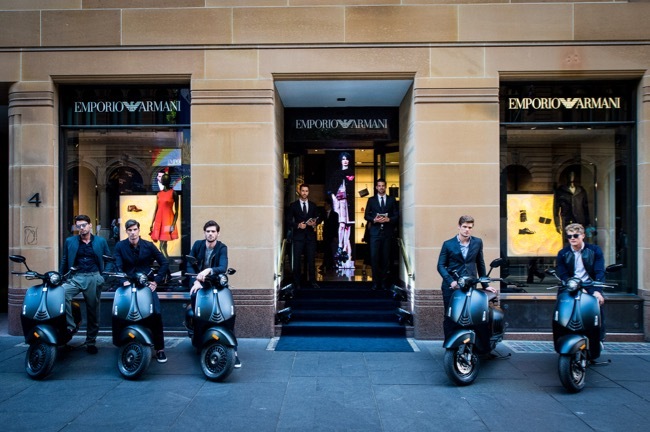 We are pleased to announce that, Vespa 946 Emporio Armani has officially launched in Australia by a private cocktail in Emporio Armani boutique at 4 Martin Place, Sydney. To mark the year 2015 - the 40th anniversary of the foundation of Giorgio Armani and the 130th birthday of the Piaggio Group - Emporio Armani has designed a special version of the Vespa 946. The private cocktail including DJ set and model presentation of Emporio Armani 2015/2016 Fall Winter collections was enjoyed by more than 150 guests for a wonderful night. Keeping Armani's signature subdued colour palette, the designer has come up with a special combination of greys with subtle hints of green visible only under particular light conditions for the project. The name 'Vespa 946' alludes to the year - 1946 - that this scooter, which has become iconic and famous around the world, was first made. 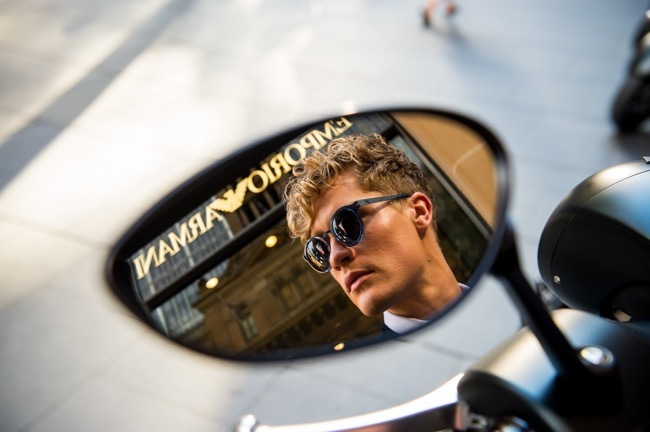 The design of the new Emporio Armani is a modern reinterpretation of the original Vespa style. The metal parts, produced using galvanic treatments, have a satin finish, and create an opaque effect in line with the finishing touches of the body. The words 'Emporio Armani' appear on the side, while the iconic eagle logo of the brand sits above the headlight. 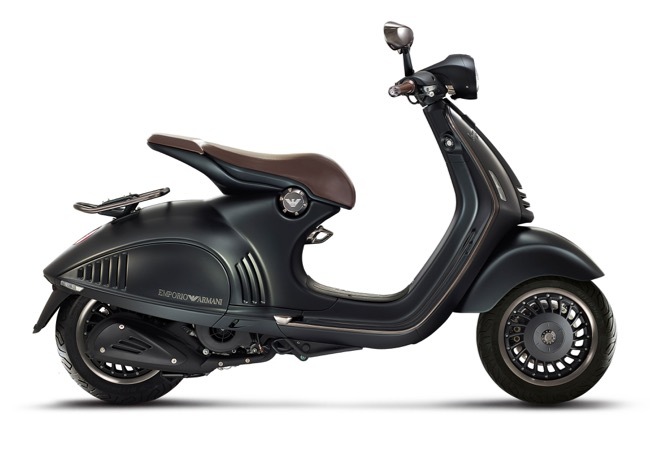 The Vespa 946 Emporio Armani is about technology as well as style. Its aluminium cylinder blocks, brown-leather finishes, luxury accessories, electronic riding controls (which also interface with the latest Internet devices) complement the innovative four-stroke electronic injection engine, whose enhanced fuel economy and minimal emissions make this two-wheeler the ideal choice for city riding. The 220 mm double disc brake, two-channel ABS braking system and large 12 inch wheels guarantee maximum safety on the road. 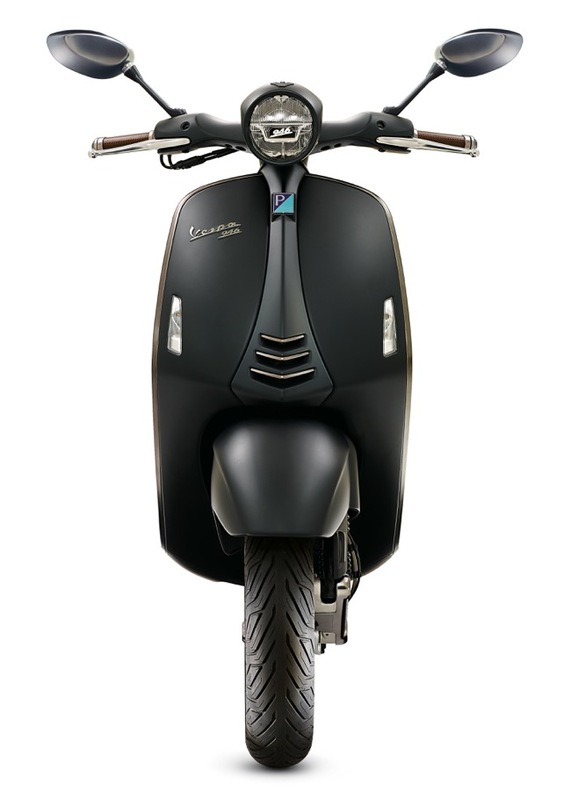 The Vespa 946 Emporio Armani will be produced in an exclusive limited run of individually numbered scooters. 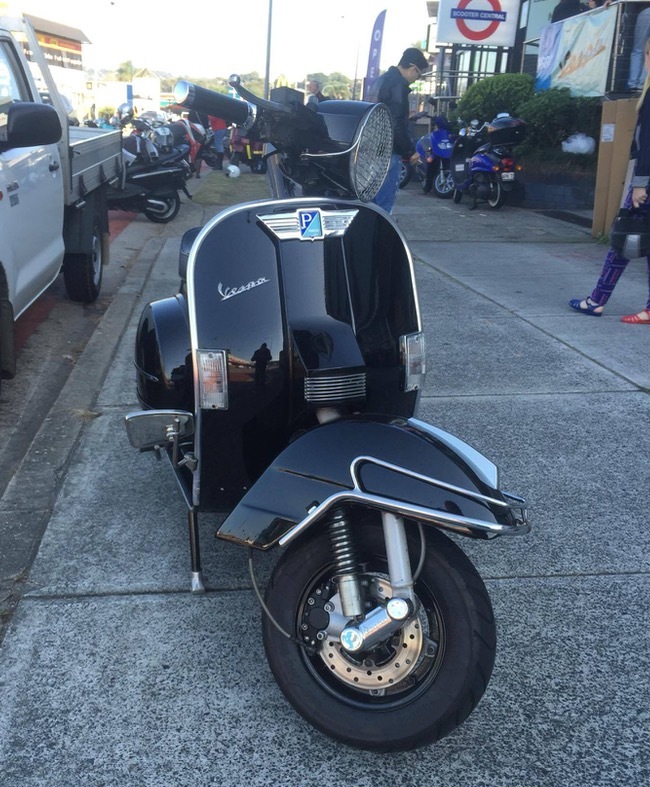 It will bring an unusual unique experience for the owner of Vespa 946 Emporio Armani. For more information on this model and exclusive accessories contact your local Vespa dealer who can be found at Vespa.com.au. 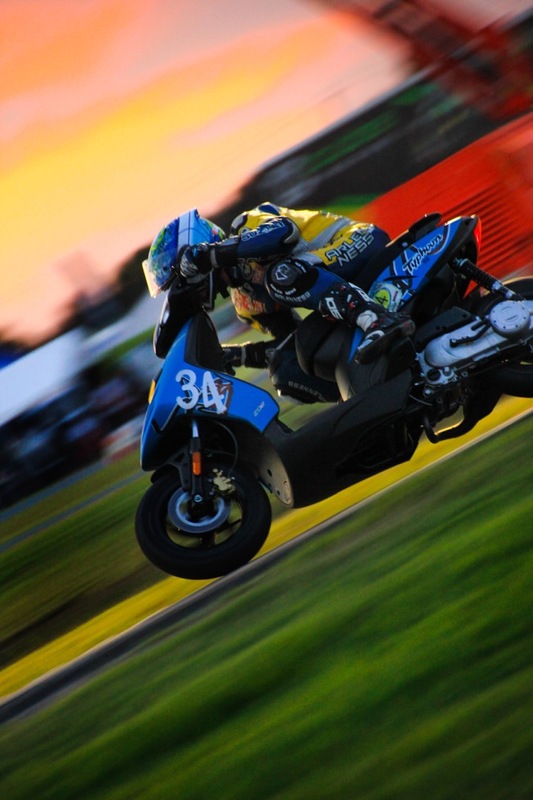 We journeyed to the Le Minz 24 hr scooter race to follow the fortunes of Brisbane Motorcycles' Piaggio Typhoon 50 team. As one of the world's most exciting spectator sports, motorcycle racing enjoys a long tradition of daredevils defying rationality by pitting high powered machinery against momentum and gravity, often reaching speeds in excess of 300 km/hr, on exotic circuits, chasing world championship success and eternal glory. So how do a gaggle of 50cc scooter enthusiasts riding around a Gold Coast go cart track for 24 hrs at speeds of less than 80 km/hr compare? 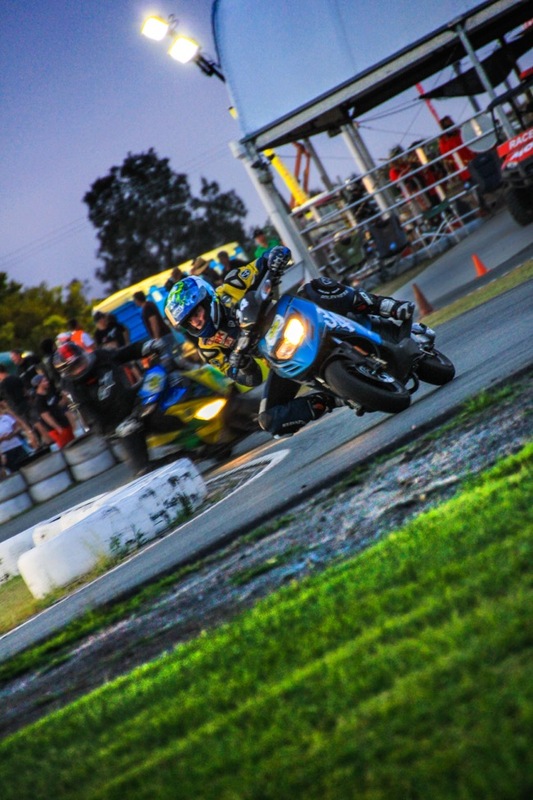 We journeyed to the Le Minz 24 hr scooter race to follow the fortunes of Brisbane Motorcycles' Piaggio Typhoon 50 team entry to find out. There may be no grid girls and the prize money might be the change you don't spend on the entrance fee but we can confirm the 24hr Le Minz scooter endurance event is no joke and taken seriously by some of the biggest racing names in the country. In fact this year's event attracted over 50 teams with enthusiast and professionals alike pitching their skills to see who would out ride, out tactic or just outlast everyone else. 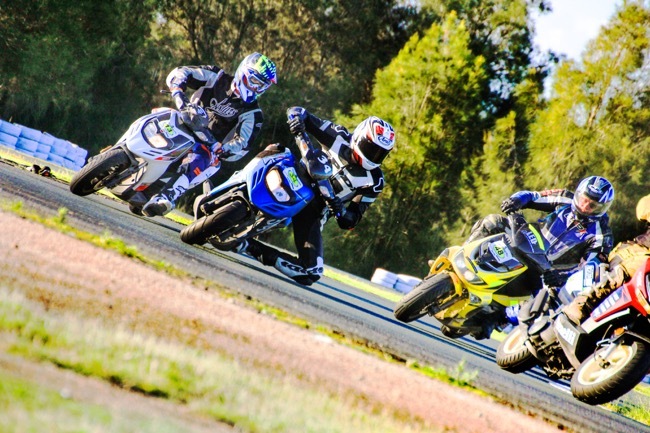 Now in its 5th year, The Le Minz this year attracted the caliber of retired international race legends like Troy Bayliss, Jason Crump and Gary McCoy, alongside young and experienced local racers from ASBK, British super bike and no end of hair brained riding challenges which pitch man against machine. For those lacking experience, enthusiasm more than makes up for the short fall providing a recipe for some serious scooter mayhem! Now most standard 50cc scooters are limited to 50 km per hr so entrants generally opt for the more exotic sports variants from manufacturers designed for speed with water cooling, sports suspensions and race ready tires. Not so Brett Mutton, owner of Brisbane Motorcycles, and newly appointed Vespa Piaggio dealer for the Brisbane metro area. 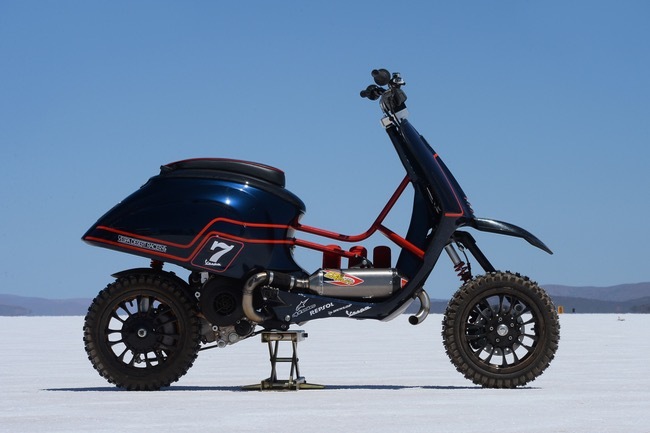 Brett chose a different path to prove one of Piaggio's best selling everyday air cooled 50cc scooters, the Typhoon 50 could mix it with the more exotic and expensive competition even electing to run on the standard knobby tires. 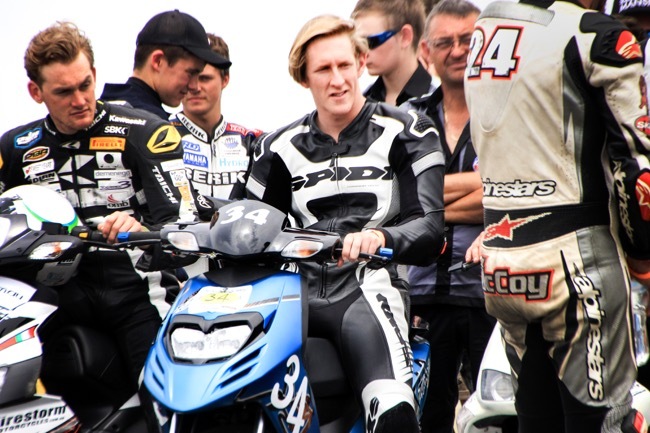 Brett's strong background in managing race teams and supporting young upcoming talent saw Brisbane motorcycles put together a talented team of young racers including ASBK champ, Ben Attard , Australian Supersport rider Kyle Buckley, upcoming talent Callum Barker and finally Brett's own son and British super bike rider James Mutton. 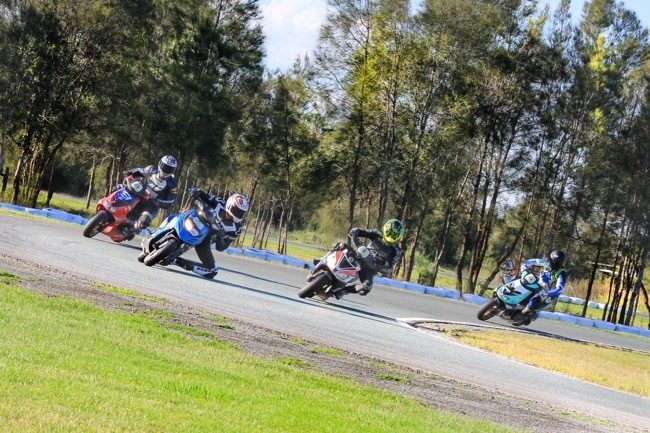 Against some racing royalty and unquestionably quicker ''stock " competition, team Brisbane Motorcycles Typhoon 50 qualified in the top 20 and the team saw an absolute flying start from James Mutton to have the team running 14th by the second lap. Brett knows tactics play as big a part in this type of race as speed, with reliability the key so an early pit stop saw the bike come in for an extended checkup while every nut and bolt was given the once over. The initial strategy put the team as far back in the field as 30th place however the strategy paid dividends as the race progressed with a hard charging Kyle Buckley reclaiming 14th position inside of the next 2 hrs. From here the hard yards were really earned as riders each committed to their two hour stints, continually ran 1' 37" laps, over the 80 lap sessions. Consistency and efficient pit-stops had the team maintain their top 15 position going into the evening stint. 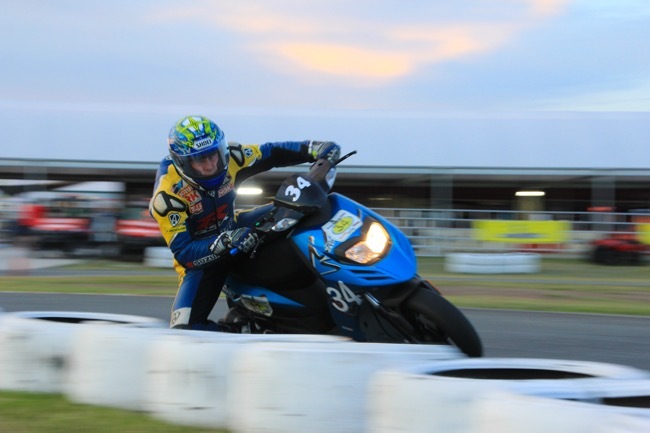 ASBK champ Ben Attard took no prisoners as he rubbed handlebars and swapped paint to maintain position in the top running group, most with better acceleration and top end speed than the standard Typhoon. Additionally to challenging the top 10, back markers also provided less than considerate lines for Ben to negotiate. As night closed in Brett's masterstroke to run with the standard Typhoon tires paid off. The balmy 30 degree weather subsided, lightening flashed and rain fell from 10:30pm until after midnight. Kyle Buckley was in the saddle and with all his skills on display applied his craft to see the superior handling of the Piaggio Typhoon run lap times up to 10 seconds quicker to challenge the front runners in lap speeds. The Brisbane Motorcycles team was on edge with anticipation, could they secure a position in the top 10 runners? With Typhoons fuel usage significantly lower than originally planned and Kyle's exceptional performance pushing the team into contention of a strong finish, Brett made the decision to skip the next scheduled fuel stop and push through a mammoth 3 hr session with Kyle on a charge. With lesser riders and bikes dropping from the race, team Brisbane powered through the waking hrs and by the 20th hour sat comfortably in 11th. The team was now closing in on a top 10 position. 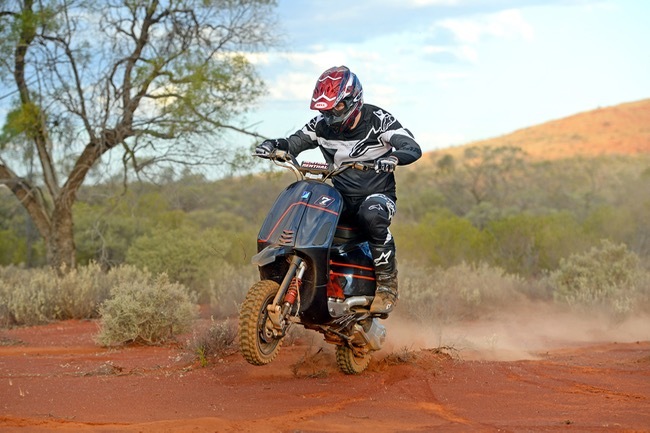 It's what you can't control which will bring you undone and so was the case with the Team Brisbane Piaggio Typhoon. At the 22nd hour disaster struck, Callum Barker holding his position in the field and nearing the end of his final 2hr session and negotiating a fast left was punted, no fault of his own, mid-corner by a competitor. The steering took the brunt of the very hard hit effectively rendering the scooter 'uni-directional'. Team Brisbane, watching on helplessly held their combined breath as Callum, with no capacity to steer and already committed to the apex valiantly went down. But Callum's racing instinct took over to regain enough composure to remount the Typhoon and with adrenaline pumping negotiate the infield, to bravely bring the scooter and himself into the pit garage. Unsteady as he was, Callum stepped off to be rushed by the team to Race Safety for treatment. Meanwhile back in the pit garage the Brisbane team worked frantically to get the Typhoon back into the race, drawing on their extensive technical experience to find a way to get back out. Ultimately it was Brett, realising the situation was beyond repair, who stepped in and asked the team to reluctantly put the tools down. 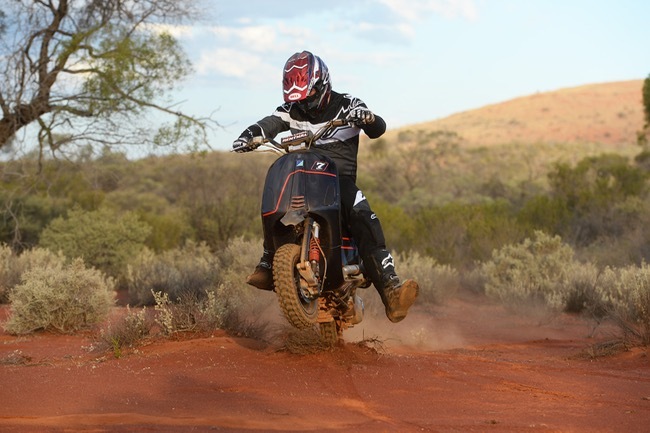 For Team Brisbane Motorcycles and Piaggio's Typhoon, the race was over. After the initial disappointment subsided it soon dawned on the team what a great effort everyone had done working as a team and talk quickly switched to 2016. Everyone on the team agreed what great effort by riders and pit crew particularly Callum who despite a broken scapular and badly bruised shoulder still managed to pilot the bike back to the pits. The Typhoon 50 also showed it was more than up to the task with reliability and fuel economy giving the team a big boost. 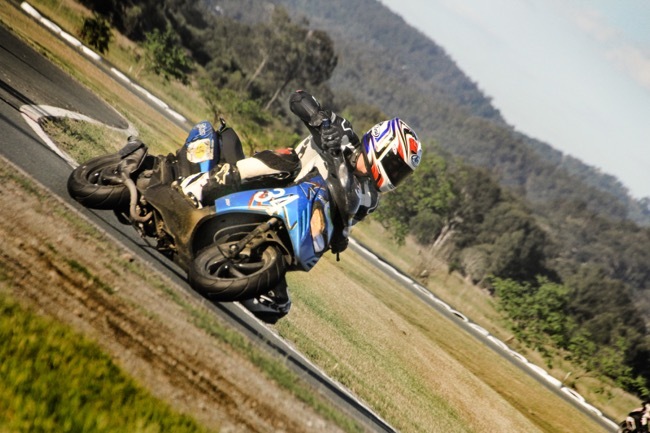 Piaggio congratulates team Brisbane Motorcycles on their valiant effort would like to thank Brett Mutton his Pit crew and the riders who put their faith in Piaggio Typhoon 50 to take on Australia's longest scooter endurance race. Visit Brett and the team at Brisbane Motorcycles where you can see the Piaggio Typhoon 50 and the complete Piaggio range of bikes. 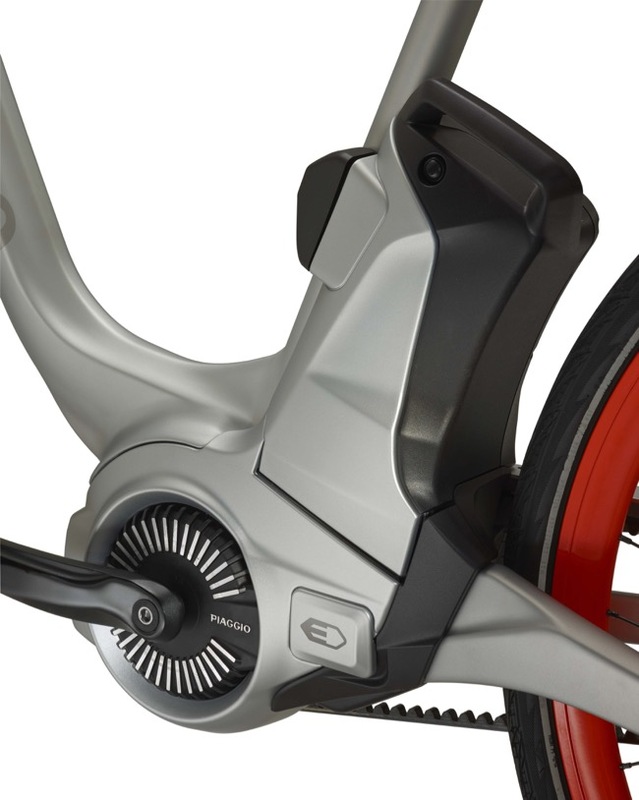 EICMA 2105 Release - With E-Bike Piaggio invents a new way to meet the most advanced mobility needs. 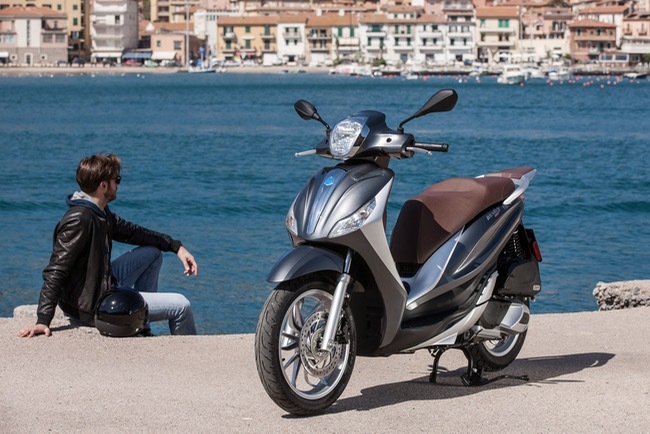 With E-Bike Piaggio invents a new way to meet the most advanced mobility needs. 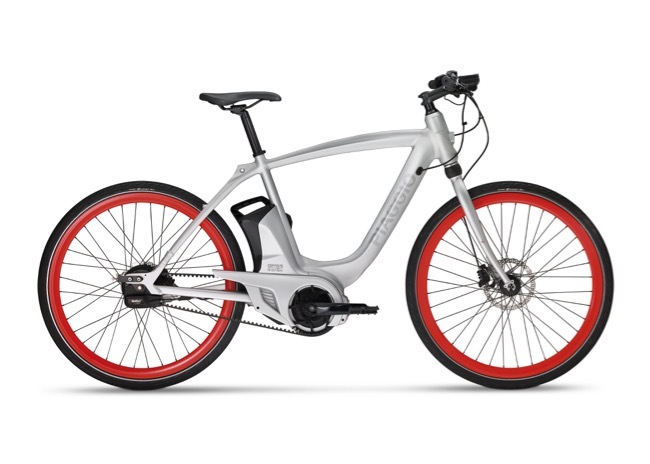 E-Bike goes well beyond the concept of an electric bicycle, providing innovative functions and new levels of interaction between cyclist, mechanical vehicle and the environment. For almost seventy years Piaggio Group has been a worldwide leader in development, production and sales of newer and newer forms of mobility. The search for solutions that combine freedom and the simplicity of travel with quality of life and respect for the environment is a mission that the Piaggio Group has always pursued. Founded on research and technological innovation, the Piaggio Group's hold on the number one spot has been strengthened over the decades in products which have favoured the freedom of entire generations and revolutionised the concept of mobility itself several times, creating not only new means of transportation but inventing lifestyles, because mobility is always synonymous with freedom. The Vespa legend which was born in the post war era, the most agile and lightweight mopeds of the '60s and '70s, and then electric, bimodal vehicles and finally hybrid engines – the only one of its kind in the scooter world – are milestones in a cultural and technological leadership that has always characterised Piaggio Group's vocation for innovation, with the earliest electric vehicle actually dating back to 1975. Out of this unique heritage of style and technology, the Piaggio Wi-Bike is born, a completely new vehicle that meets the most advanced needs and the most modern mobility trends. Piaggio Wi-Bike goes beyond the concept of an assisted-pedal bicycle and approaches the market as a vehicle that interprets the most progressive mobility needs at 360 degrees, no longer intended simply as the ability to move about, but also as the presence and sharing of information over the most modern network and interaction forms with your vehicle. 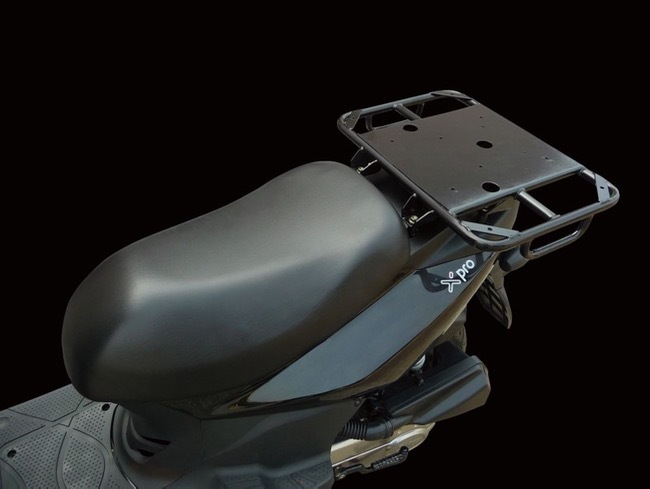 Thanks to PMP (Piaggio Multimedia Platform) technology, the Wi-Bike has an ultra advanced man-mechanical vehicle interface and guarantees constant data sharing with the world, giving you with the opportunity to interact from any location and with any environment in its physical, social and experience dimension. The heart of the Piaggio Wi-Bike is a 250W-350W electric power unit with 50 Nm of torque entirely designed, developed and built by the Piaggio Group. It is an ultra modern and extremely compact motor with a shape designed for perfect insertion in the elegant aesthetics of the frame. In fact, its axial-symmetric shape, in other words, designed around the pedal axle, allows it to include the entire electric motor hidden behind the sprocket in order to greatly reduce the aesthetic impact. 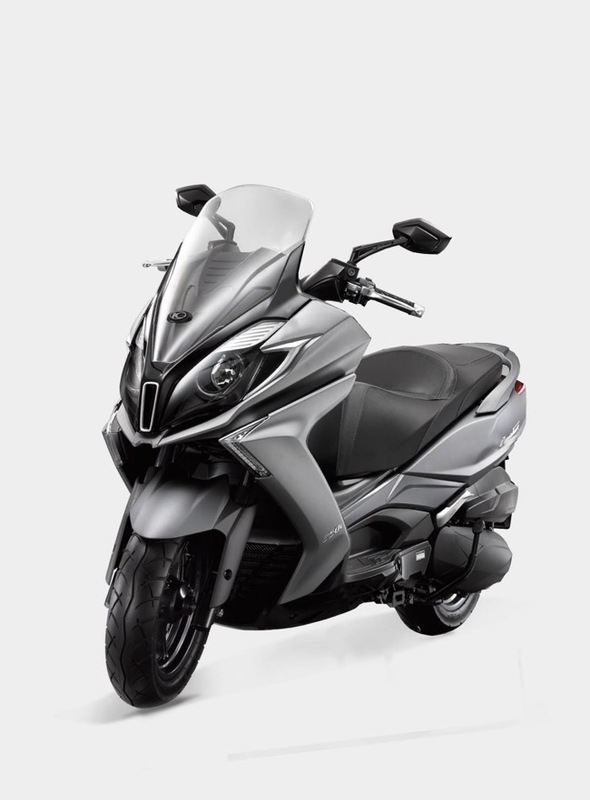 But it is the entire powertrain (the motor, battery and control display assembly) of the Piaggio Wi-Bike that stands out for the technology it uses and for the functions it provides. Advanced algorithms developed by Piaggio guarantee an innovative control of the electric machine, all to the advantage of reliability. The latest generation display is “contactless” and automatically powered, near the control unit, thanks to NFC (Near Field Communication) technology. The USB connection serves the dual function of being a smartphone charger and software update port. 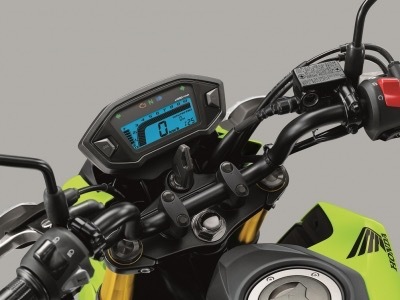 Diagnostics are also possible via smartphone by the rider, whereas for the service centre operations are possible via tablet – thanks once again to Bluetooth technology – for a more complete check. The Piaggio Wi-Bike, thanks to its technology, also stands out for its high level of safety: the dashboard control unit, batteries and electric motor are connected unequivocally and therefore the three units can operate only if connected and communicating with one another. For example, removing the display (which operates as a electronic key) when parking renders the Wi-Bike effectively unusable. A GPS/GSM module is housed in the battery which functions both as a satellite anti-theft device and a data transmission element from/for the battery. If the system detects a theft attempt of the vehicle, an alert is sent immediately via the dedicated app and the vehicle's position is tracked on the map. You can also check on the charge status with a smartphone and receive the alert notice on your device in the event of a poor charge, for example after a long period of disuse. The 400 Wh ion and lithium battery is elegantly housed under the saddle in correspondence to the vertical pipe and provides particularly long range, on average between 60 and 120 kilometres depending on the operating mode and conditions. Complete recharge time is just over 3 hours. The battery guarantees the highest possible level of safety and it is completely waterproof (IP 65). 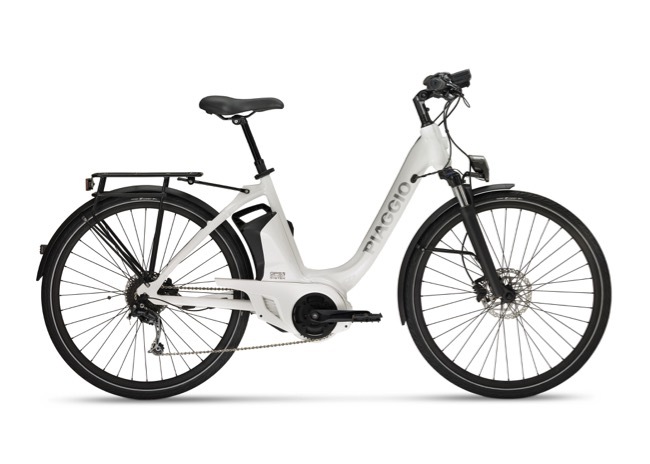 The Piaggio Wi-Bike uses a belt drive combined with an advanced continuous variation automatic transmission, electronically assisted to always ensure the best possible ratio between an almost infinite choice of combination. This is technology that takes advantage of the Piaggio Group's extensive technical experience with this type of transmission. Completing the range of available drives are a continuous variation belt drive which allows you to select the ideal ratio, shifting smoothly, and a traditional high quality, 9 speed chain final drive. As a tribute to active safety the powerful braking system is made up of two 180 mm discs on the front and 160 mm on the rear, gripped by hydraulic callipers. Thanks to the PMP (Piaggio Multimedia Platform) technology, your smartphone integrates functionally with the Wi-Bike via Bluetooth. In fact, the app developed by Piaggio specifically for the Wi-Bike allows new features to be developed constantly. From the fine tuning of "classic" services such as navigation up to more advanced control of the powertrain operating modes over and above the base settings. In fact, conventional electrically pedal-assisted bicycles offer a limited and determined number of pedal assistance level settings with a contribution from the motor that always stays proportional to the energy applied by the cyclist once the operating mode is selected. 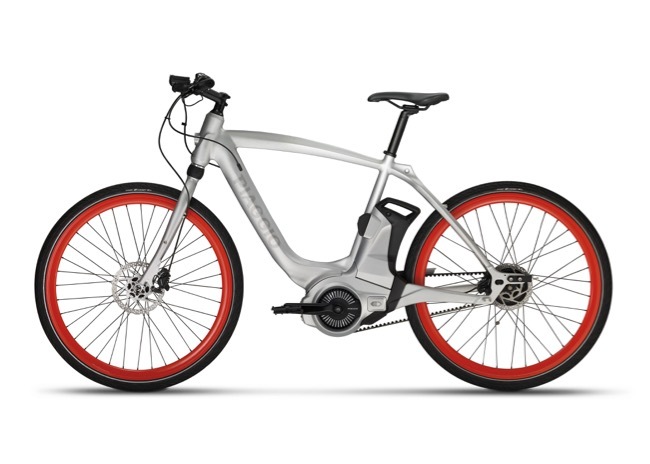 The Wi-Bike, thanks to the exclusive DEA technology (Dynamic Engine Assistance), allows the user to program the assistance level provided by the electric motor at a percentage that is always variable in ratio to the power provided by the cyclist. 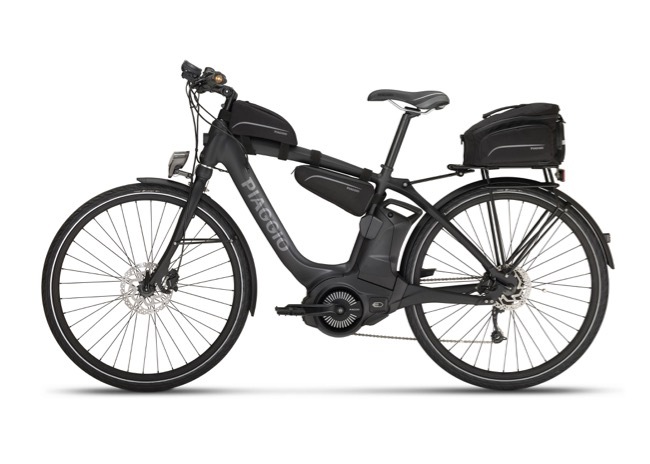 Thanks to the possibility of varying the motor contribution, Piaggio Wi-Bike is a true fitness machine where the cyclist can set his or her physical effort (for example, 100W of effort and a determined frequency of pedalling) leaving the motor free to increase or decrease its contribution based on the altimetric variations in order to comply with the set parameters which are consistent with the training program that the rider wants to achieve. Also, through the app you will be able to select predefined power output modes throughout the arc of use, real “motor mappings”. 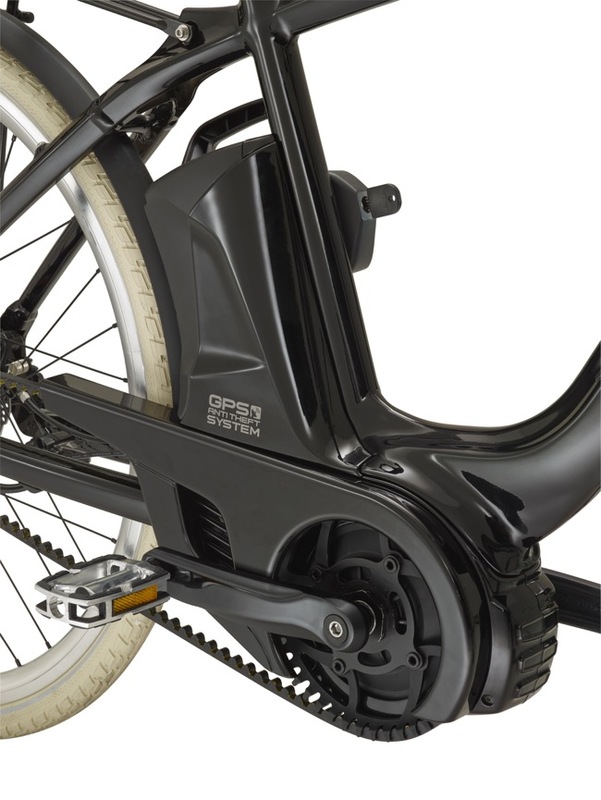 STANDARD: the motor develops power proportional to the effort detected on the pedals. CITY: a boost of power at every start. To get off the line ahead of the rest effortlessly in “Stop & Go” city traffic. HILL: the motor adapts to the slope of the road surface, developing more power uphill and less on downhill or flat sections. Each of these motor maps can be set to ten different assist levels for efficient battery use. The PMP system, which can be controlled through your smartphone's screen and by buttons on the handlebar, is the base for virtually unlimited function developments. The potential uses PMP offers cover the entire range of data management: it goes from use information to functions connected to fitness and allows users to use the Piaggio Wi-Bike as a training tool in order to monitor health information and to achieve goals in terms of heart rate or calorie burning. 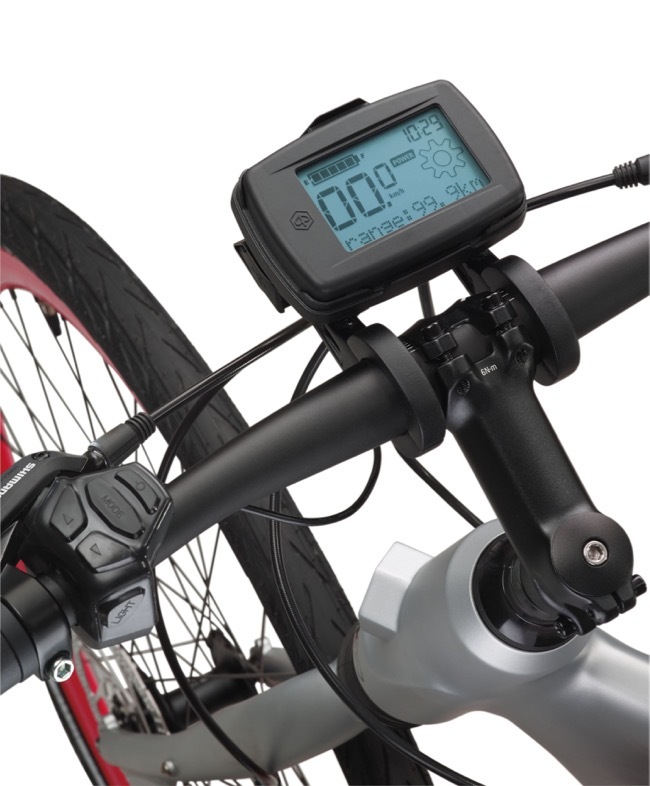 Connectivity between the bike electronics and heart rate monitors, for example, allows you to manage the electric motor power output based on a heart rate range goal (the lower this is the more the assistance provided by the motor will be). This way an athlete can carry out his or her training programme and manage his or her frequency on the route. In commuting, on the other hand, you can choose not to exceed a maximum heart rate threshold for health reasons, or simply to keep from becoming overheated on your way to work. Wi-Bike also means “community”: at the end of each training session or simply on completing your ride, you can share the data related to the experience you've just had with your friend on the most common social networks. The elegantly sport design that sets Wi-Bike apart is the result of the Piaggio style centre which worked to combine the best and most distinctive Italian design with functionality and operating convenience. Modern style, refined solutions and simplicity are the keywords that inspired the Piaggio Group designers in their work. The result comes together in a frame made entirely in aluminium with a clearly sport look that mounts a shock absorbed fork, also made in aluminium and which is available in various versions of Piaggio Wi-Bike starting from the classic male and unisex duo. 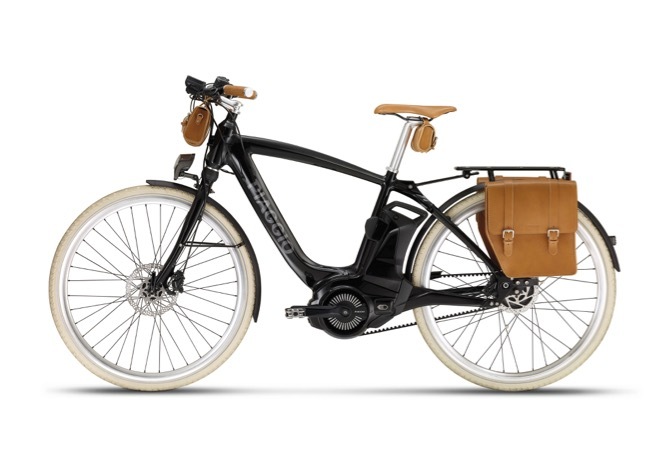 From a stylistic point of view the challenge of seamlessly inserting the powertrain parts (electric motor, transmission and battery) into the frame was particularly successful, leaving the bicycle's lines rationally clean and undisturbed. In fact, the motor, designed around the pedal axle, remains hidden by the sprocket, whereas the battery, housed under the saddle on the horizontal pipe, can be easily removed. And so the Piaggio Wi-Bike's attention to simplicity and user-friendliness substantiates in shapes which have been conceived with functionality in mind and as a tribute to the elegance of Italian design. Piaggio Wi-Bike is available with four different equipment packages. COMFORT: this is the entry level vehicle in the Piaggio Wi-Bike range; the easiest and most accessible for any user and available in the frame version without the top crossbar to facilitate getting on. It comes standard with a telescopic fork, comfort seat, adjustable handlebar connection and ergonomic hand grips. It is available in three different frame sizes to adapt perfectly to any body type. Two drive options: traditional mechanical or with manual operated variator. COMFORT PLUS: compared to Comfort this is a superior package which includes genuine leather ergonomic seat and hand grips, as well as some classy details such as a different type of tyres. Two drive options: manual operator variator or electronic control. It is available in the unisex version (frame without top crossbar and in three different sizes: S, M and L) and in the men's version (frame with top crossbar and two different sizes: M and L). 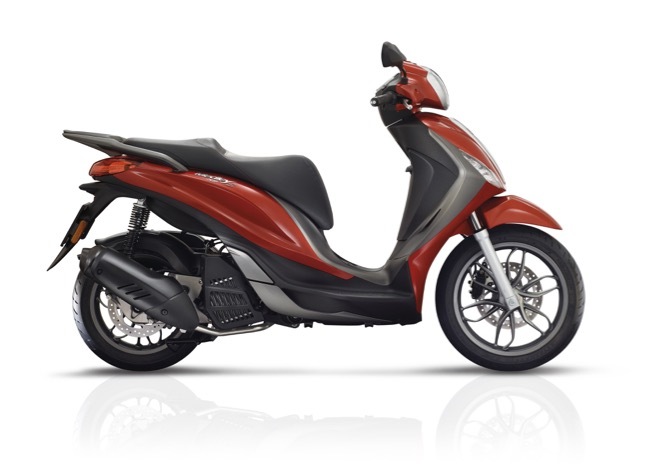 ACTIVE: this is the Piaggio Wi-Bike version in a sportier design. The frame is available in the men's version (frame with top crossbar) in two different sizes (M and L). Active stands out for its drive with three operating options: traditional mechanical, manual operated variator and electronic control variator. ACTIVE PLUS: the sportiest version stands out for its dedicated graphic variations and the equipment package which also includes precious leather seat and hand grips. The frame is available in the men's version (frame with top crossbar) in two different sizes (M and L). Two different options for the drive manual operator variator or electronic control. For current Piaggio Australia models visit Piaggio.com.au.